I awoke to glorious sunshine (and a fire alarm), fantastic (not so fantastic). I rushed my cooked breakfast (first one for a month) in order to catch the early bus to Rosehearty, which would avoid a walk along the main road. I was looking at today’s route when the bus arrived, and I didn’t get on. The driver even asked me if I wanted to get on as I had my bag in hand, but the thing was I couldn’t face another long day with wet feet and no paths. 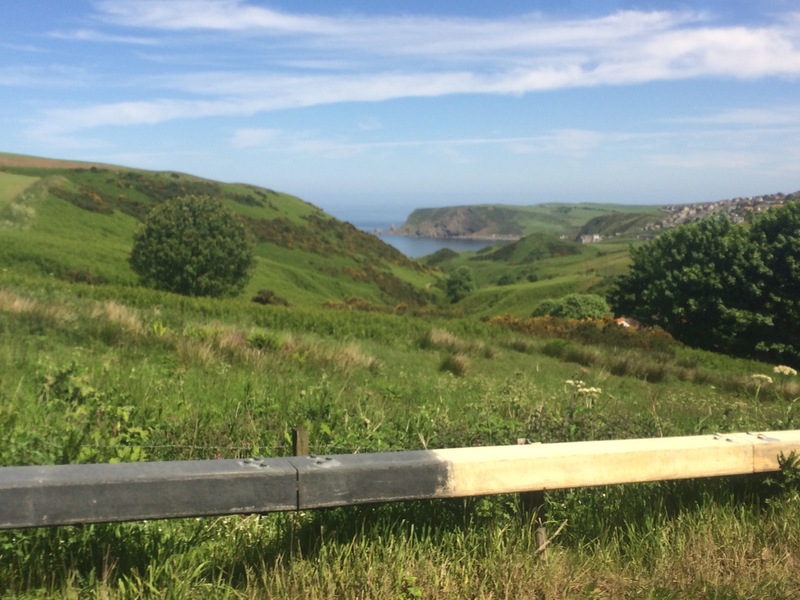 There were no defined paths on the map virtually the whole way to Macduff and I knew that my walk would involve forcing my way through more long grass, nettles and thistles, and probably navigating my way around some farmers’ fields and climbing fences. None of it was appealing. 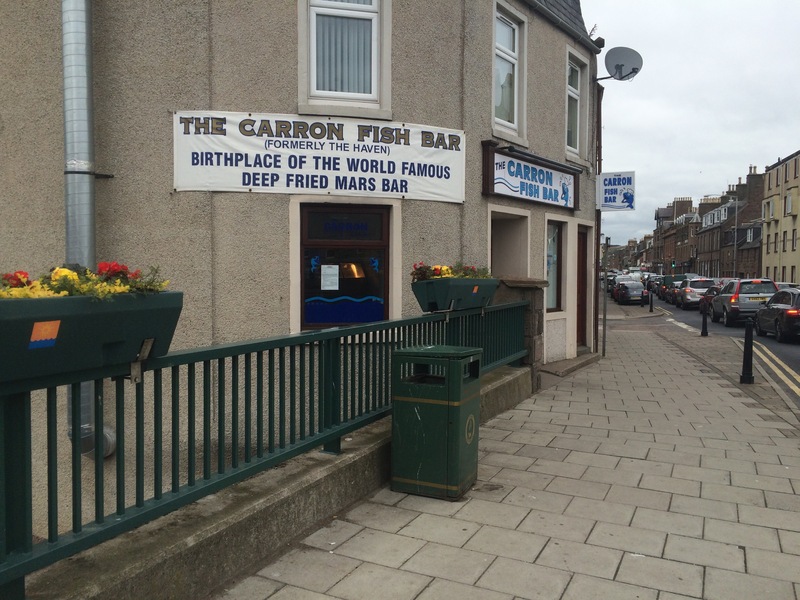 I had a quick rethink and decided to catch a bus all the way to Macduff instead. This new plan meant I had a couple of hours to kill in The Broch (Fraserburgh) so I headed to the very corner, the NE tip, in order to contemplate life. 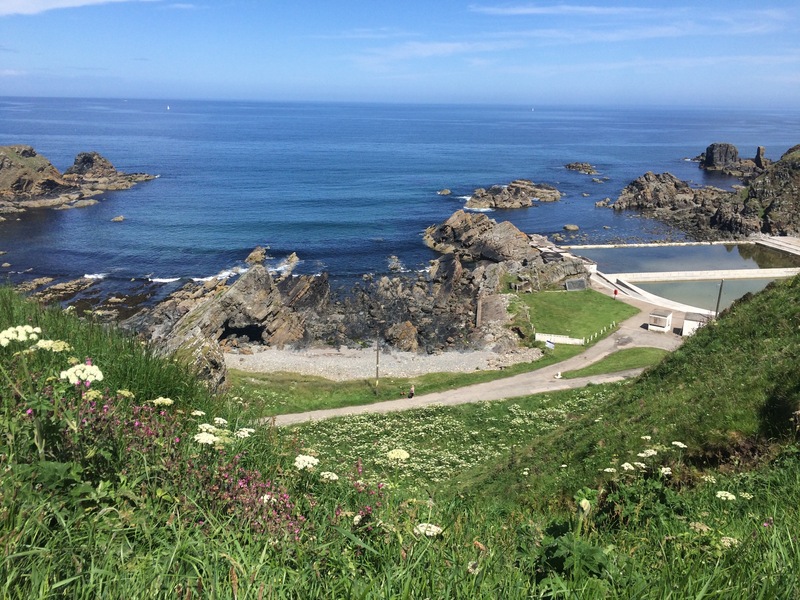 Fraserburgh marks the start of the Moray Firth, all 500 miles of coastline up to Duncansby Head (John O’Groats). 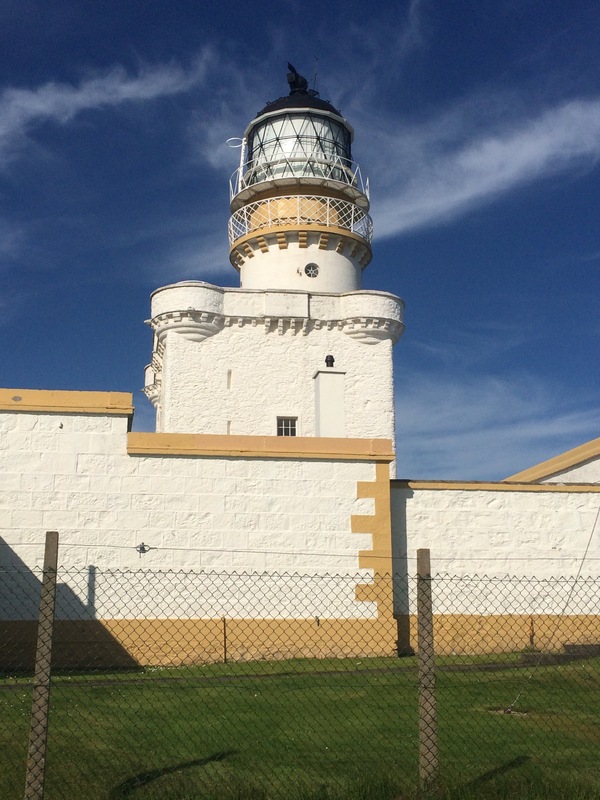 Kinnaird Head Lighthouse was the first one to be built by the Northern Lighthouse Board in 1787 and it was built into an existing castle. 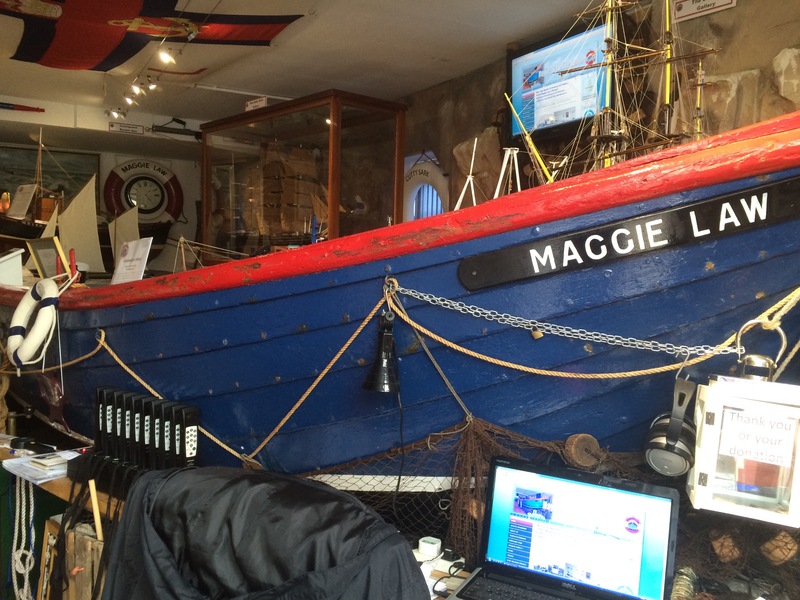 Now it is part of the Fraserburgh Lighthouse Museum. There is also a heritage museum (although I was too early for either museum to be open) and I wandered around the grounds. 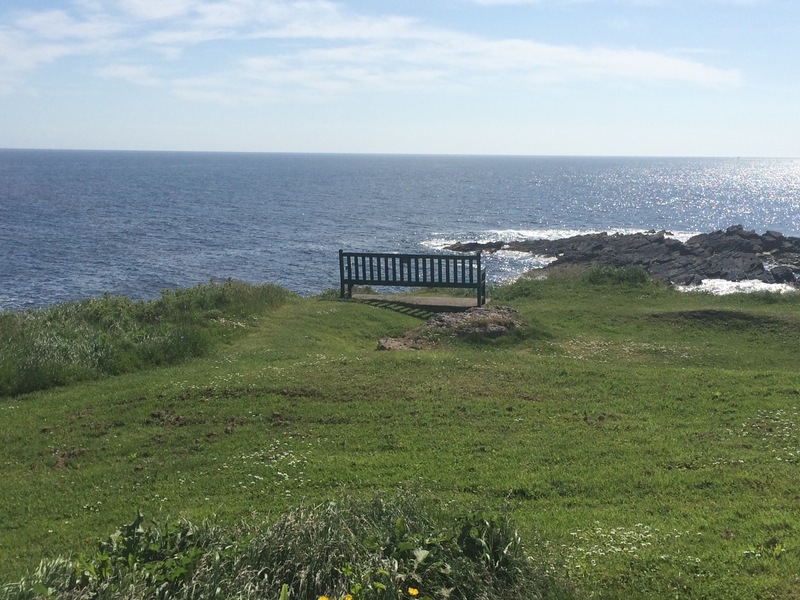 I walked right onto the Head and sat on a bench looking at the sea for ages. 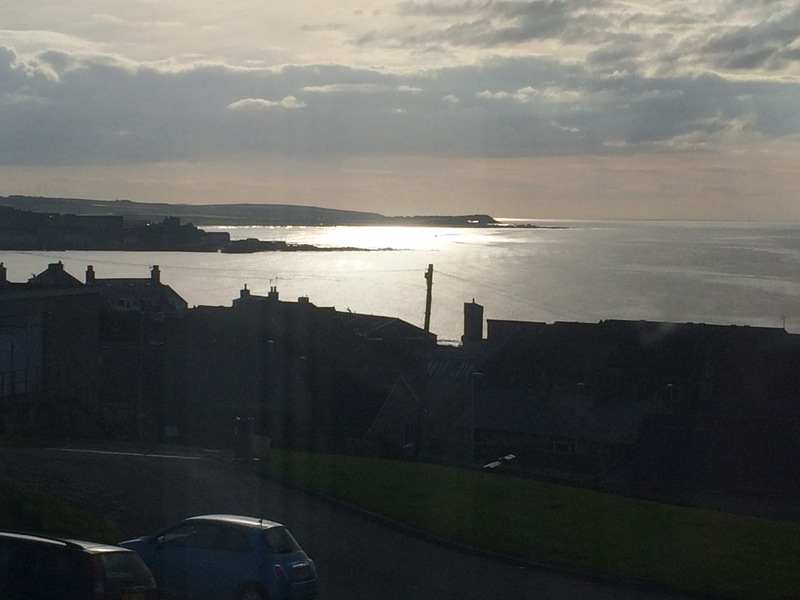 I watched a few birds and just enjoyed the sunshine glinting on the water and the sound of the sea. It was lovely and peaceful. I eventually walked into town, the usual small, grey streets I am becoming accustomed to up here. The pavements are so skinny that there are no fronts to any of the shops and I find it strange walking down a street with shops where you can’t see the shops until you’re right outside them. I bought a newspaper and sat in a cafe to enjoy a leisurely Saturday morning coffee and paper…just like home! I caught the bus and we stopped at a couple of the small fishing towns I was missing. They looked stunning, albeit the sun was shining today. The cliff walking I was missing looked pretty tough as there were lots of beautiful valleys containing burns that flowed down to the sea, so there would have been a number of steep descents and climbs, with fences to clamber over. The Tore Burn valley leading not into Cullykhan Bay looked the biggest and most impressive, filled with gorse. 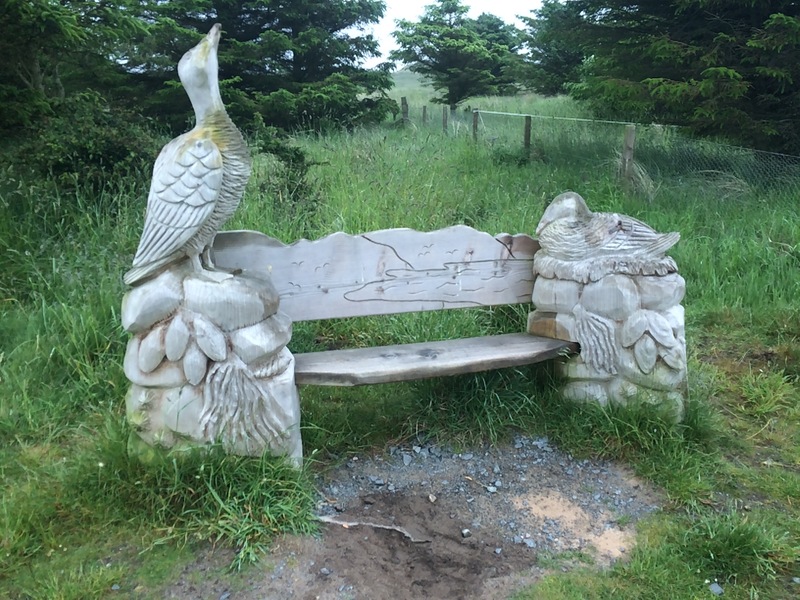 Looking back at Gordonstown – look at the hills! In Gardenstown there were some kids jumping off the harbour wall into the sea. It was a shame I missed Troup Head as that is a rather dominant feature along the coast and also an RSPB reserve. 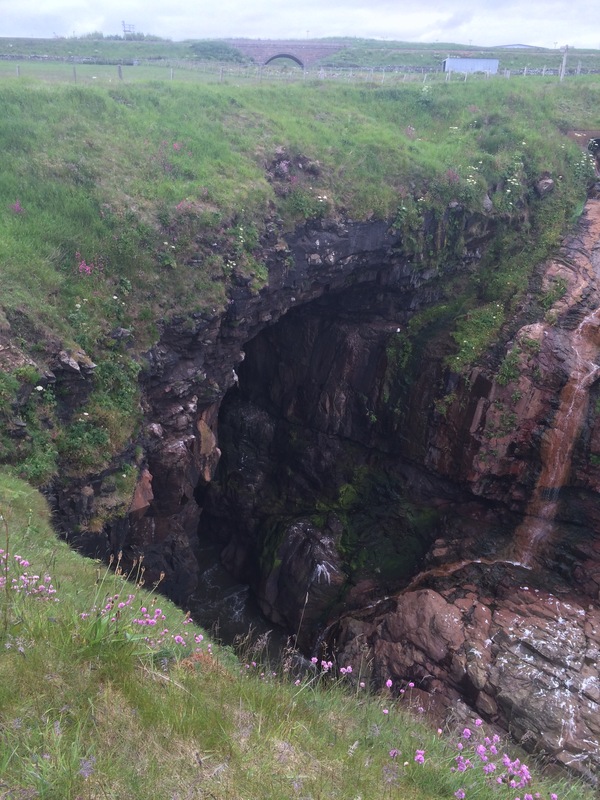 Once in Macduff I headed back East a little, along the golf course, to get a good view of the cliffs I had missed. Tarlair outdoor pool is a relic waiting to be rescued. It could be amazing and it’s in a phenomenal location. Although it probably doesn’t get much sun if the last 3 weeks are anything to go by. I walked into Macduff, enjoying that my boots were properly dry for the first time since Sunday. I had forgotten what colour they were! Rain clouds were coming overhead so I ducked into the Macduff Marine Aquarium and spent a couple of hours learning more about the diversity of marine species in the Moray Firth. It is an excellent facility with a huge tank open to the elements. 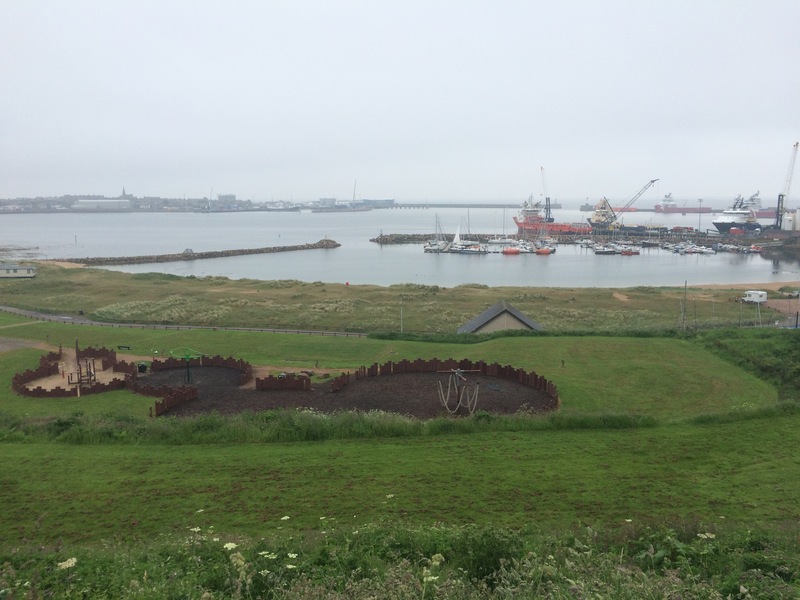 I learned that there are 30 types of shark in the Moray Firth (including dog fish and other related species), and that kelp ‘trees’ can grow up to 30m tall. Hopefully I will see some more dolphins, and maybe even whales. 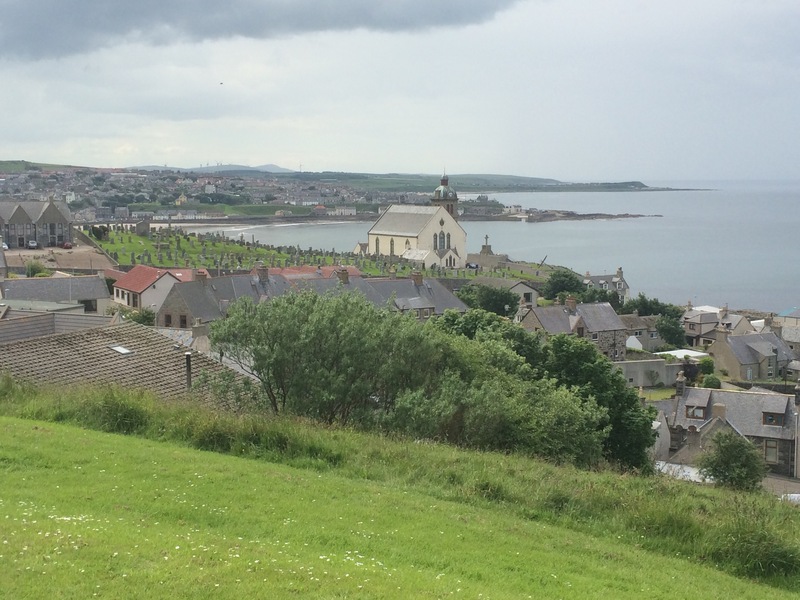 I walked through the Macduff streets, up the hill to the war memorial, and admired the view across to Banff and beyond. I could just about make out the hills in N Scotland, across the Moray Firth. I checked into my guest house (not looking forward to the karaoke or the help-yourself-breakfast) and was advised there were only 2 options for dinner: the Chinese, or the Knowes Hotel. I went for the hotel. Great view from my window seat and there were hardly any customers in the only restaurant in a reasonably sized town on a Saturday night. This seems to me to be a difference between Scotland and England. Another grey day. Will they ever end? 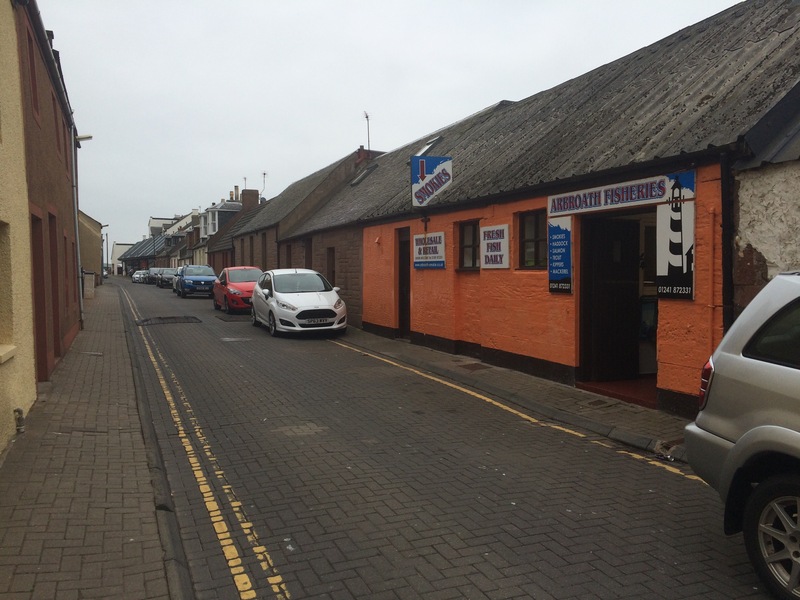 It took me the best part of an hour to get to the centre of Peterhead so I stopped for a proper breakfast: a huge pancake with maple syrup and a coffee. It seems that bed and breakfasts in Scotland rarely provide a proper breakfast, at least the ones I stay at all seem to offer self-service cereals, and they’re not even cheap! 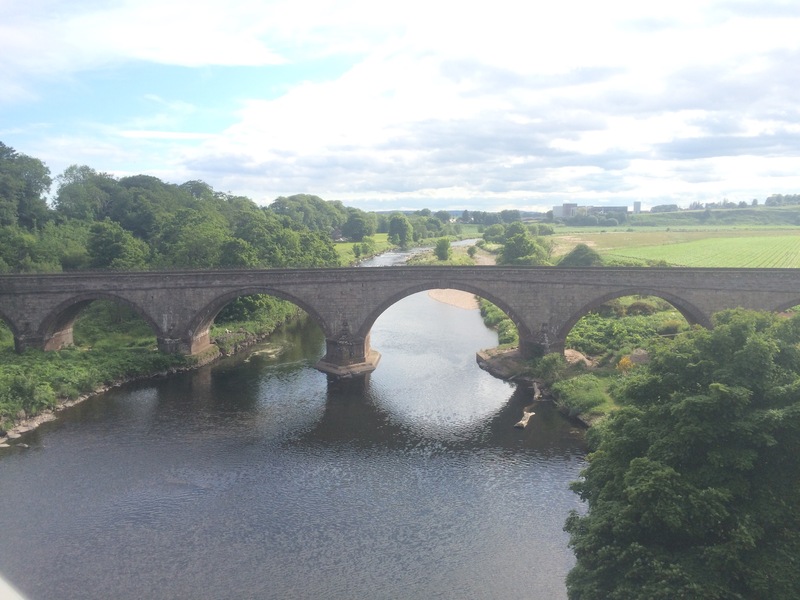 I crossed the Ugie River via the Birnie pedestrian bridge leading to Peterhead Golf Club, the 18th oldest in the world. Before the bridge was built by a benefactor in the early 20th Century the golf club had to provide a ferry-man to allow access from the town. 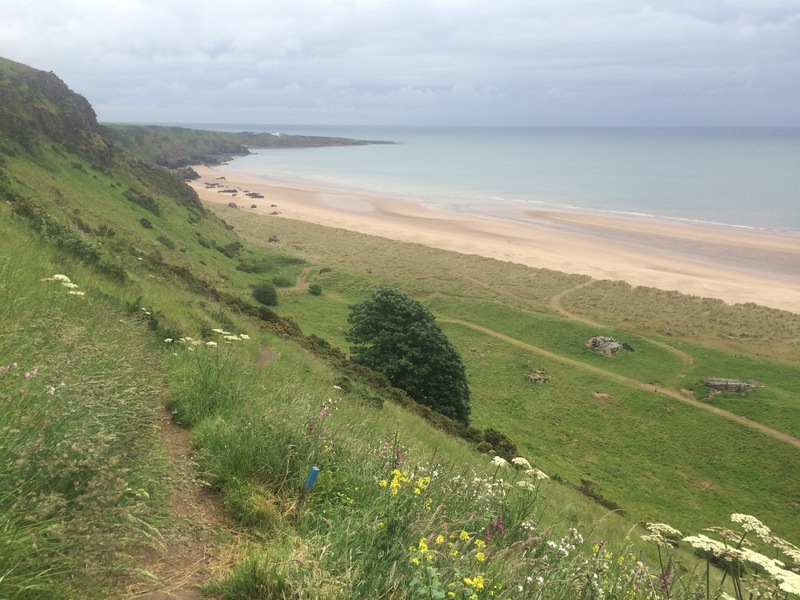 Here an old lady enquires about my walk and told me I needed to stay land-side by the burn at the end of the golf course as the beach had sinking sand. I took her advice on board and wished I hadn’t. The burn didn’t even reach the beach and I ended up walking through yet more wet grass in the dunes and so my feet, socks and boots were soaked again. I was not happy. I had to jump down a sand dune to access the beach and then it was a 3 hour walk, mostly along the beach, to St Combs. There wasn’t much to see today, only a few birds and no people. I took a detour into the dunes at Scotston to find a path that would lead me to a bridge across a burn just before a huge gas terminal. Annoyingly, the path over the bridge and beyond was overgrown so I was treated to another soaking for my feet and legs and several nettle stings. Another jump down a sand dune cliff was required to access the beach again. 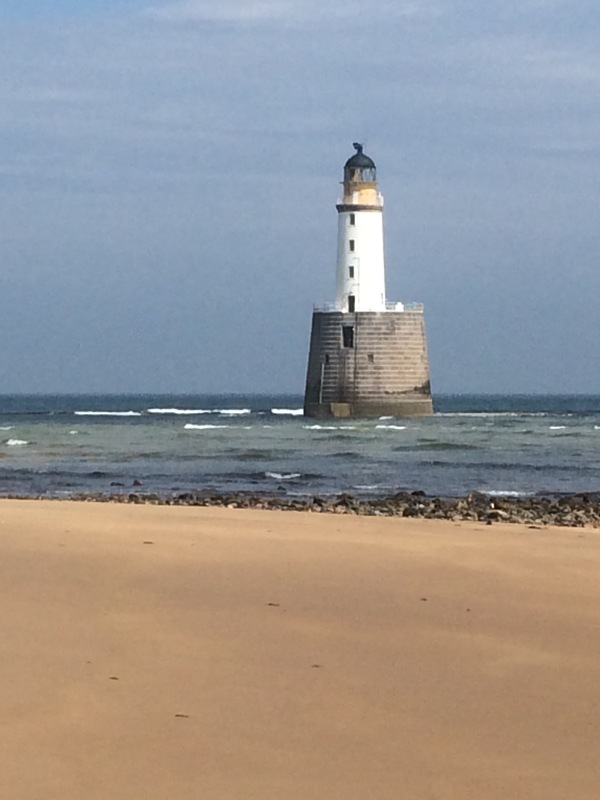 Amazingly, as I approached Rattray Head the sun came out for an hour and I got a nice view of The Ron lighthouse just off shore. 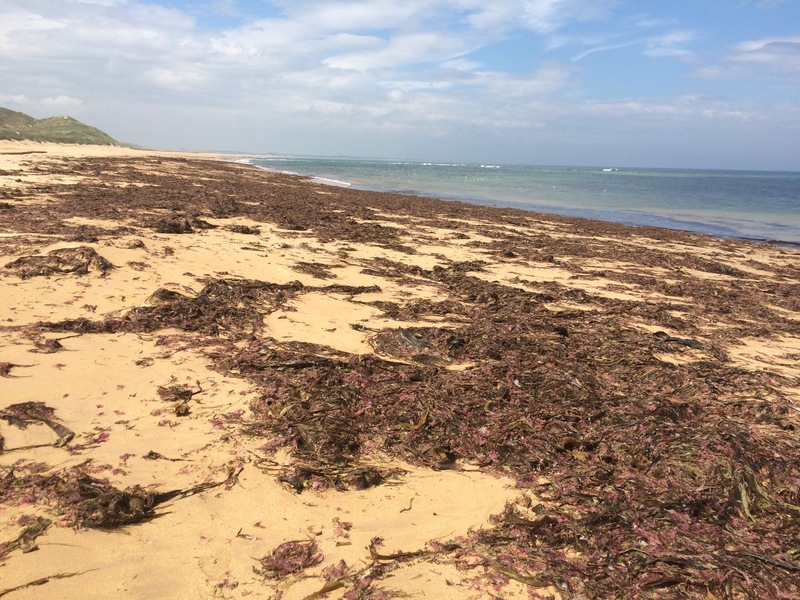 The wind dropped off a bit as I rounded Rattray Head and there was lots of seaweed on the shore. At the next burn, coming out of Loch of Strathbeg behind the dunes, I took my boots and socks off and paddled across to avoid a detour into the dunes to find the bridge. I took the opportunity to sit down, eat my lunch and try to dry my feet and socks off a bit. 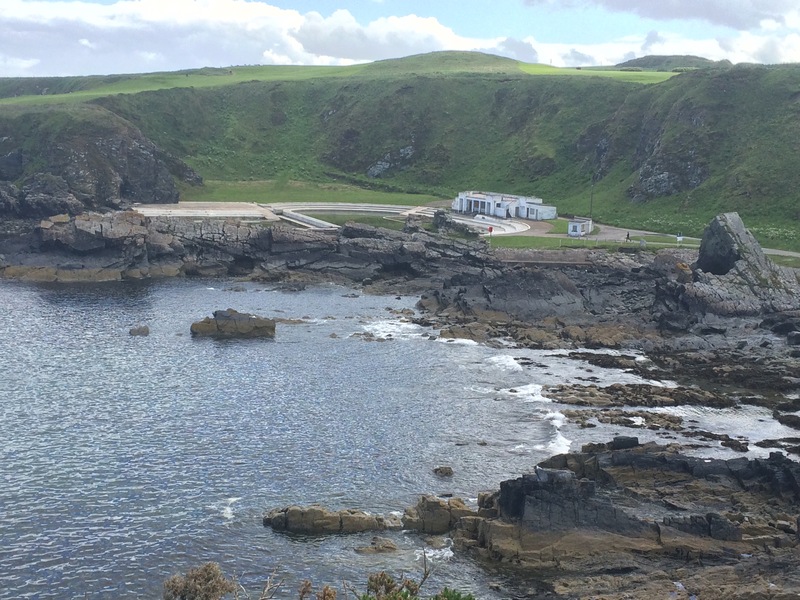 St Combs and Inverallochy were both grey towns with nothing going on. 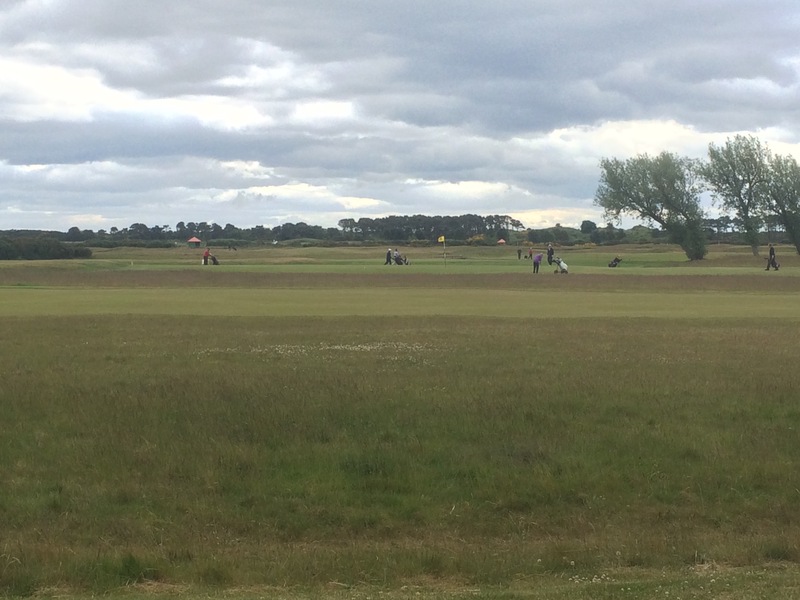 They were linked by a golf course that had some huge, grey and soulless-looking houses by the side of it. At Inverallochy I decided to get the bus the last 4 miles to Fraserburgh as my feet were getting sore from 2 days of walking with wet socks and boots. Standing at the bus stop it started raining; decision vindicated. 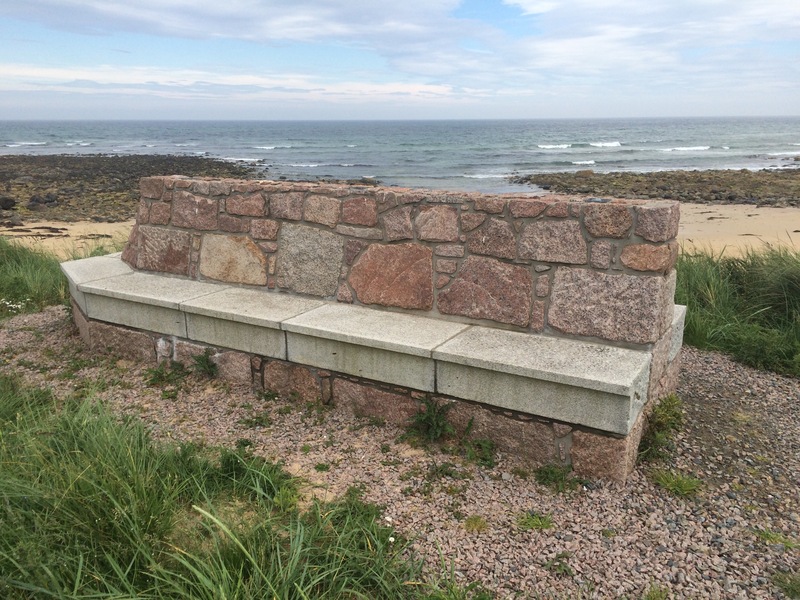 A bench at St Combs – built to withstand the elements! 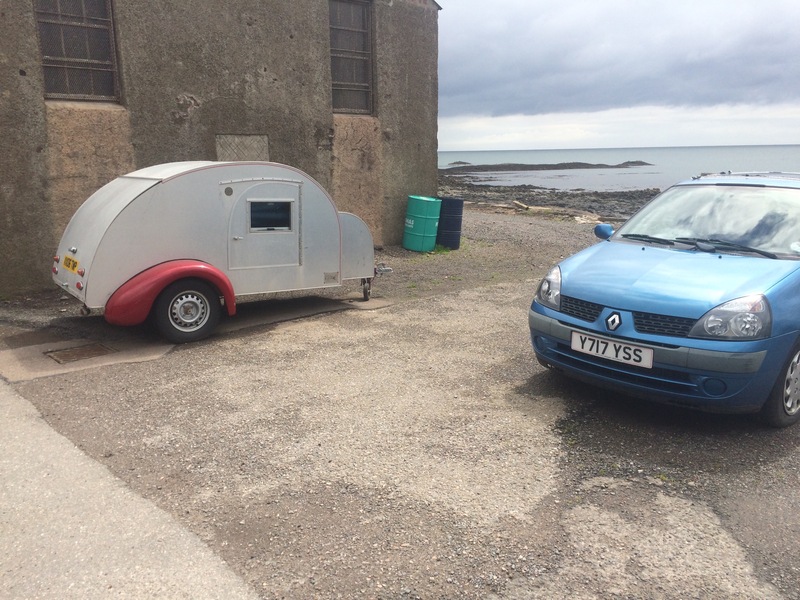 I arrived in Fraserburgh in time to collect my next set of maps from the Post Office and find my Guest House. This one does serve breakfast, hurrah. When I looked out of the window this morning all I could see was mist. Not very inspiring but I caught an early bus back to Newburgh anyway. It wasn’t raining but everything was wet. 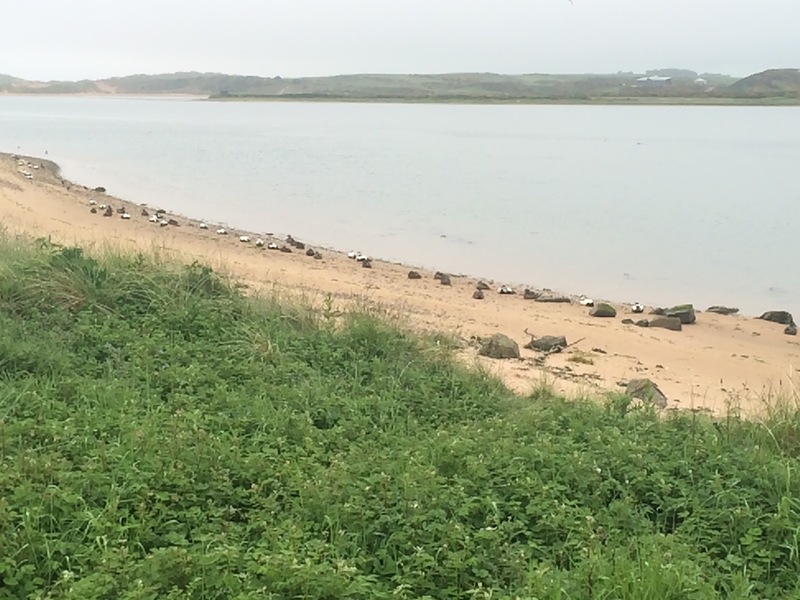 I walked over the bridge crossing the Ythan River and then entered the Forvie Nature Reserve. Here there is an Eider duck sanctuary and I saw lots sat by the water, as well as a few seals. It was over a mile across the dunes and down to the beach. 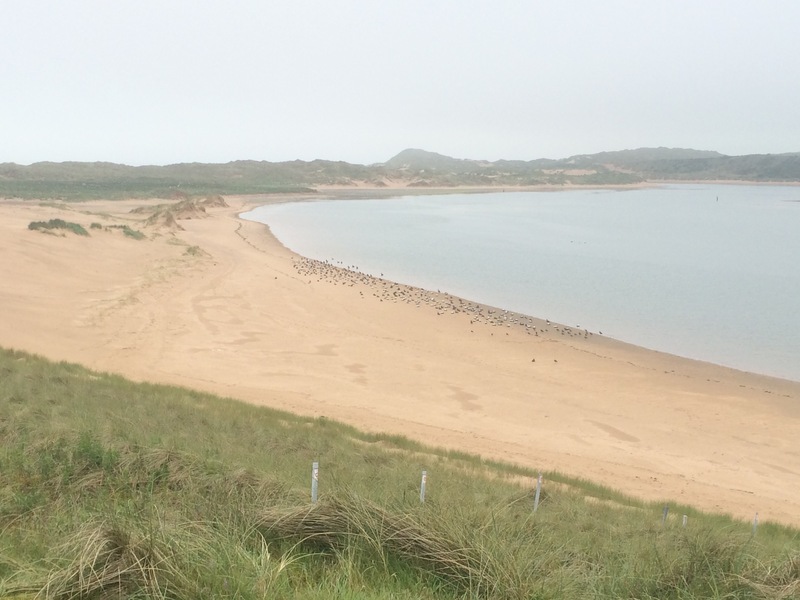 At one point I came up over a dune to be hit with a wonderful view of the Ythan, Eider ducks and terns everywhere. 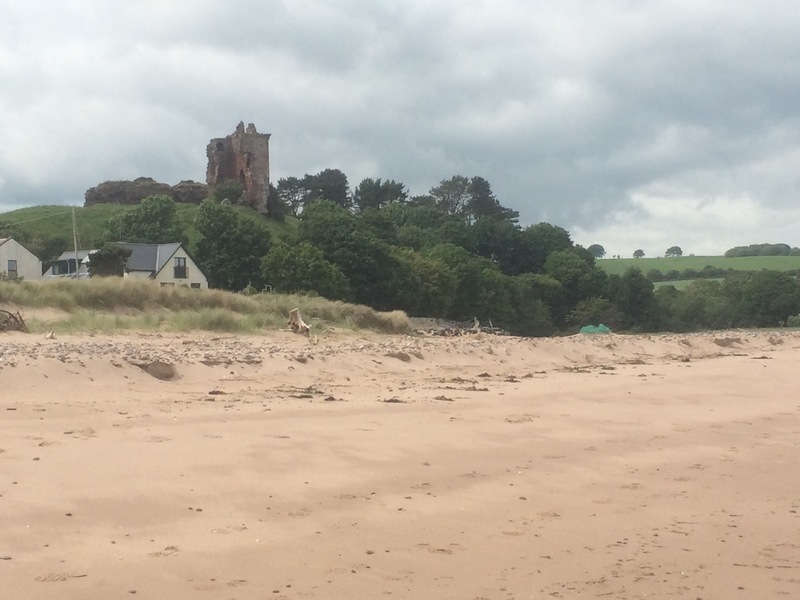 A couple of miles along the beach watching the terns catching fish and then it was back into the dunes, past the remains of a village lost to the dunes many years ago, and then into Collieston. 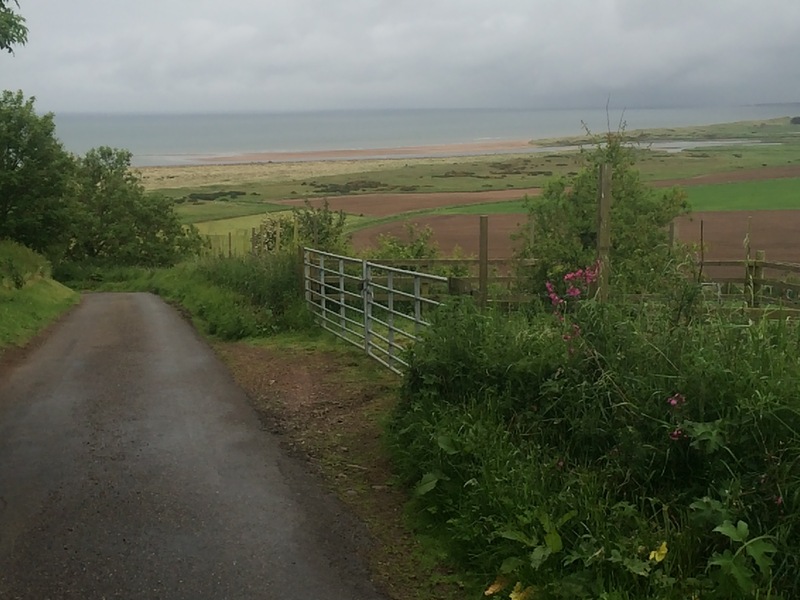 Like a number of coastal villages I pass, it has no facilities, no shop, cafe or pub, just houses. 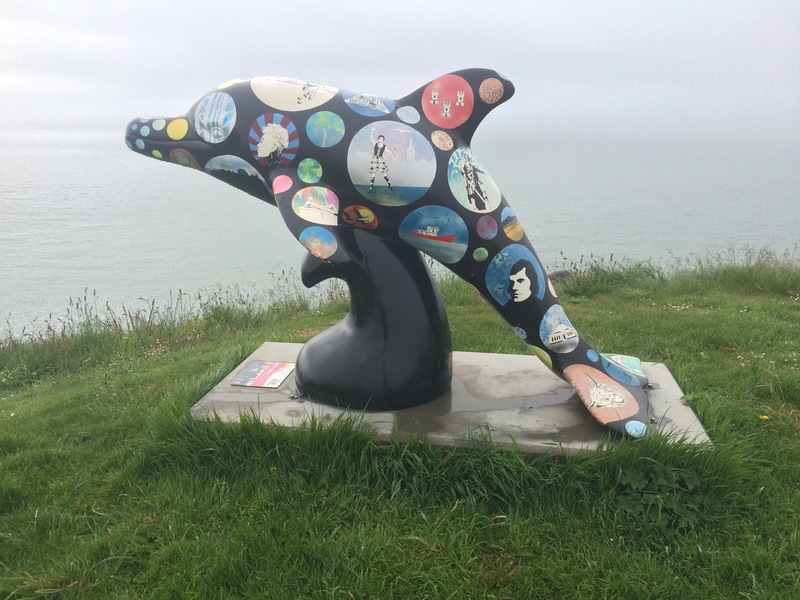 All the gardens seemed particularly well tended though and there was a dolphin on the cliff. From Collieston I made my way up onto the cliffs. Although it wasn’t raining I was forced to don my waterproof trousers as the path was not well maintained and was overgrown with hip-height grass, nettles and thistles. It was so wet that it didn’t take long before my goretex boots were soaked through and I was squelching again. From Collieston to Whinnyfold was very hard going, following mainly sheep tracks that were narrow and difficult to see through the grasses so there was a lot of stumbling. 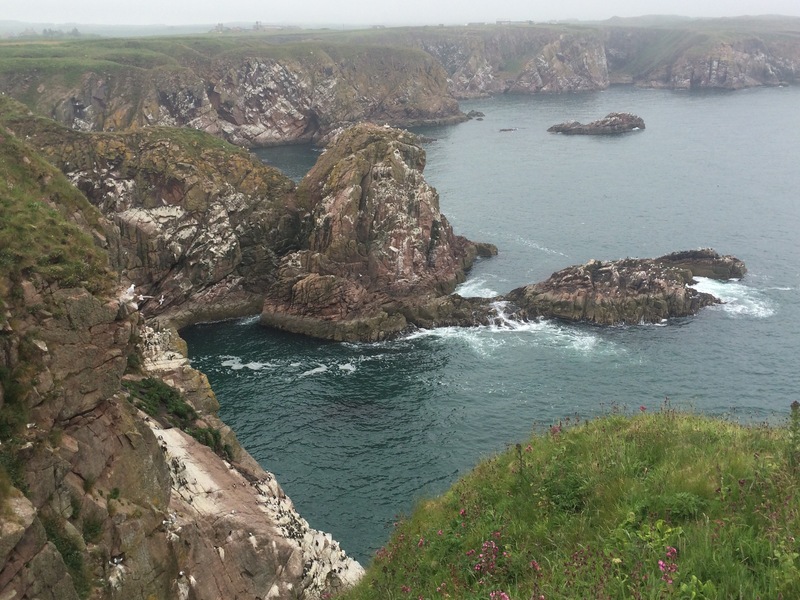 The weather was grey and misty for a lot of the day so the view of the first Slains Castle of the day wasn’t the best. 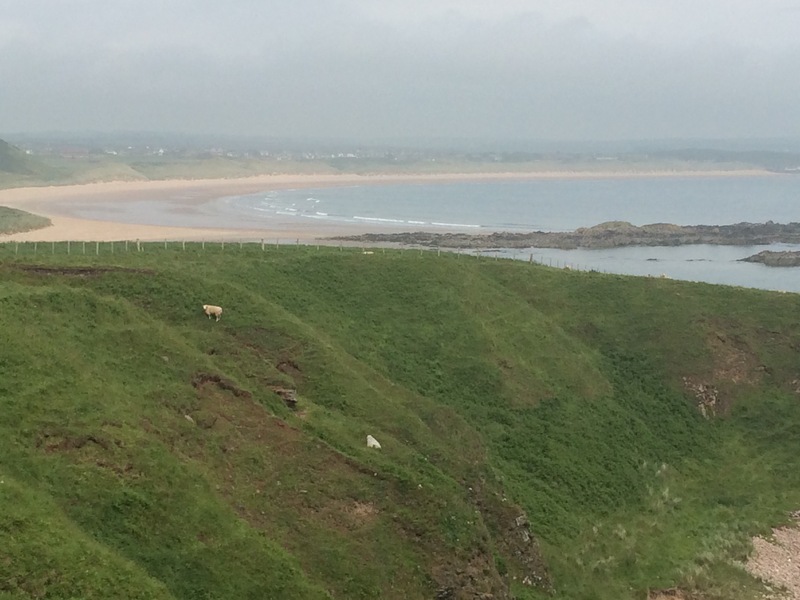 I came across a farmer rounding up his sheep that were grazing on the cliff edge. 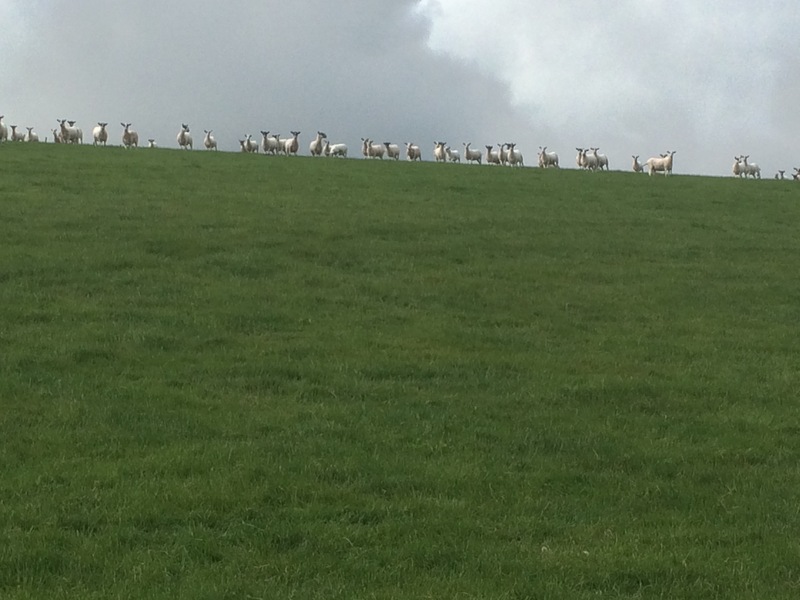 He was putting them back in the field as they had sore feet from walking the same sheep tracks all the time, but they liked grazing the cliff. I had to listen carefully as his strong accent made him very difficult to understand. It was easy to understand his complaints about the weather though; he should have harvested his crop 2 weeks ago in the June sunshine, but not this year! 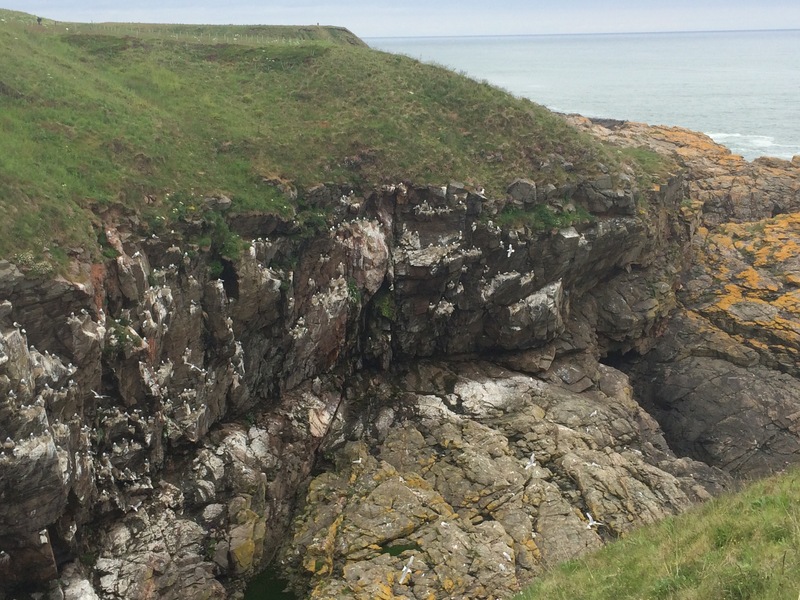 At one point I stumbled across a juvenile peregrine falcon perched on the cliff as I rounded a bend. We stared at one another before he took off. I stood and looked and so was screamed at by 3 peregrines circling above me until I moved far enough away from their nest. I was lucky to get such a good, close view. 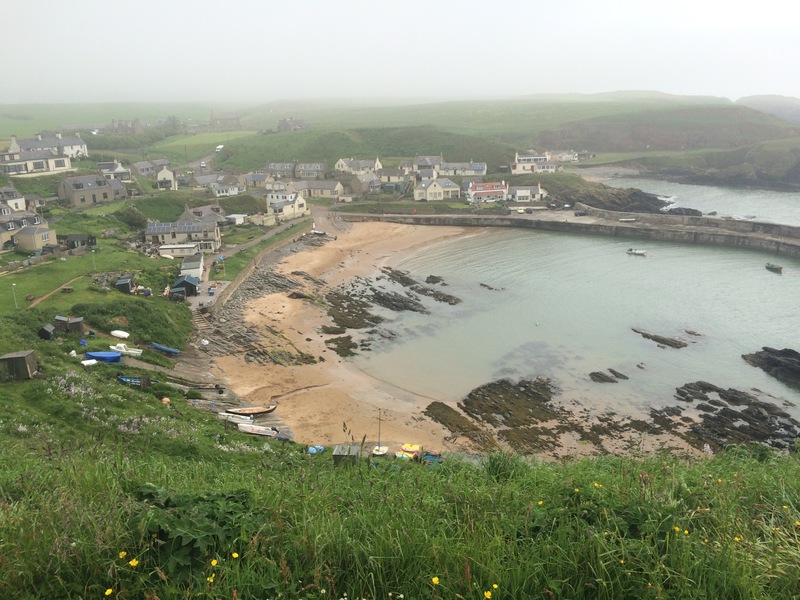 I was able to take my waterproofs off at Whinnyfold (another village with just a few houses) as the path rounded the cliff top and dropped down to Cruden Bay so I could walk along the beach. 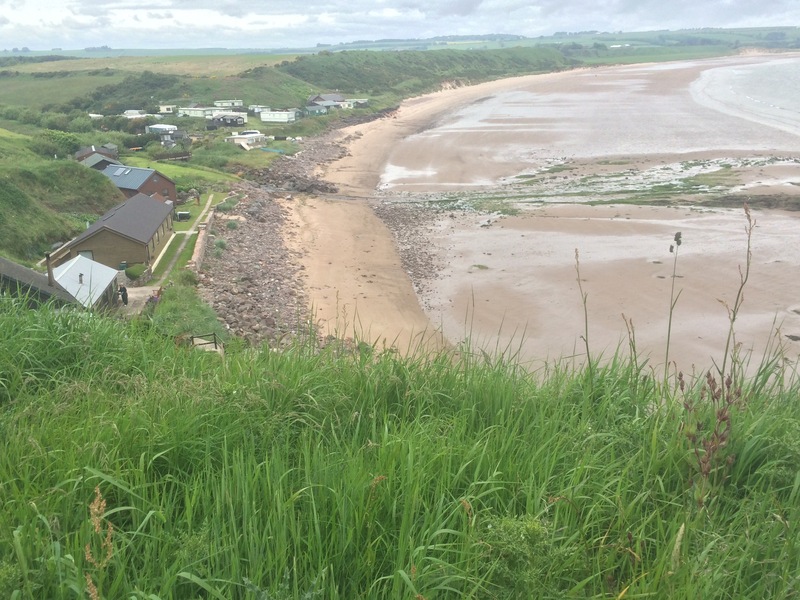 Cruden Bay beach was where a Norwegian Kommander took off from in July 1914 on his way to completing the first crossing of the North Sea by air. The town has 2 convenience stores and a pub so I decided to stop for a nice lunch as I was soaked and tired. I can recommend the Kilmarnock Arms Hotel. 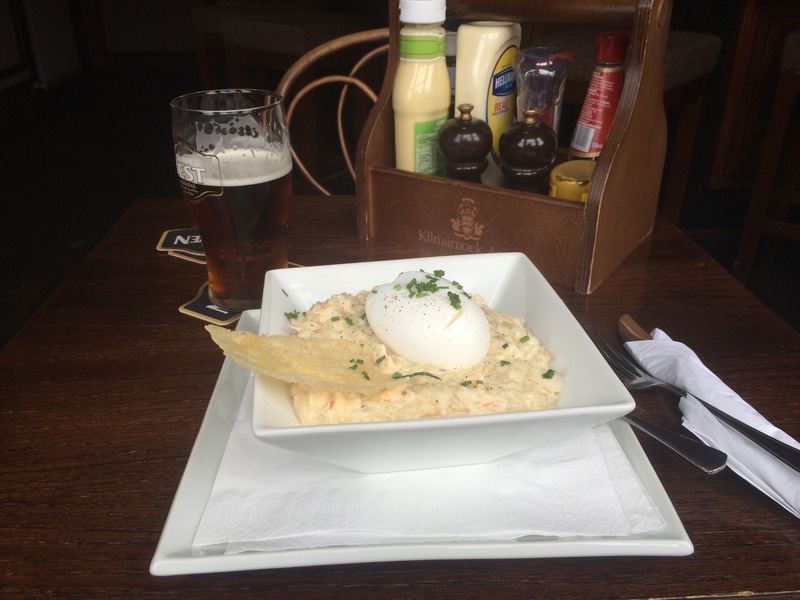 Smoked Ugie haddock risotto with a duck egg and a parmesan crisp – just what I needed! The last stretch was on the cliff top again but this time there was a better path for most of it. 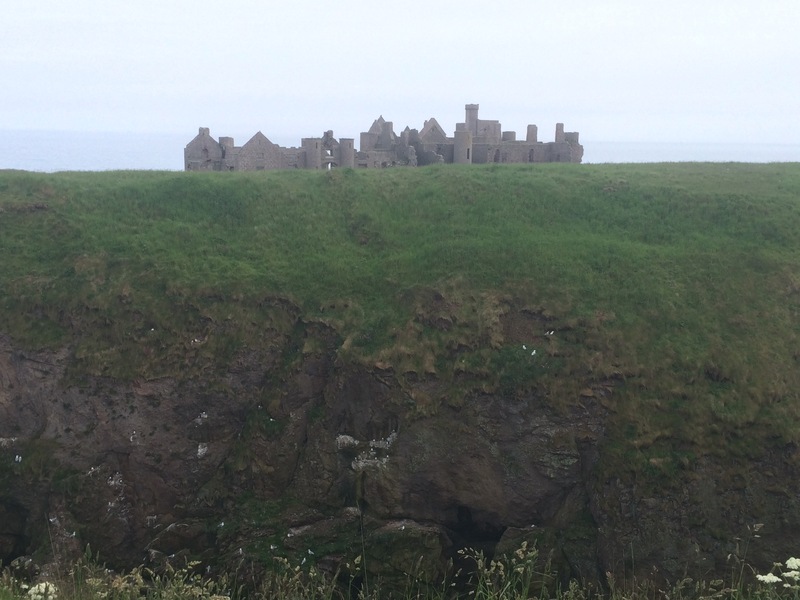 I walked to the 2nd Slains Castle, which was bigger and more imposing than the first. 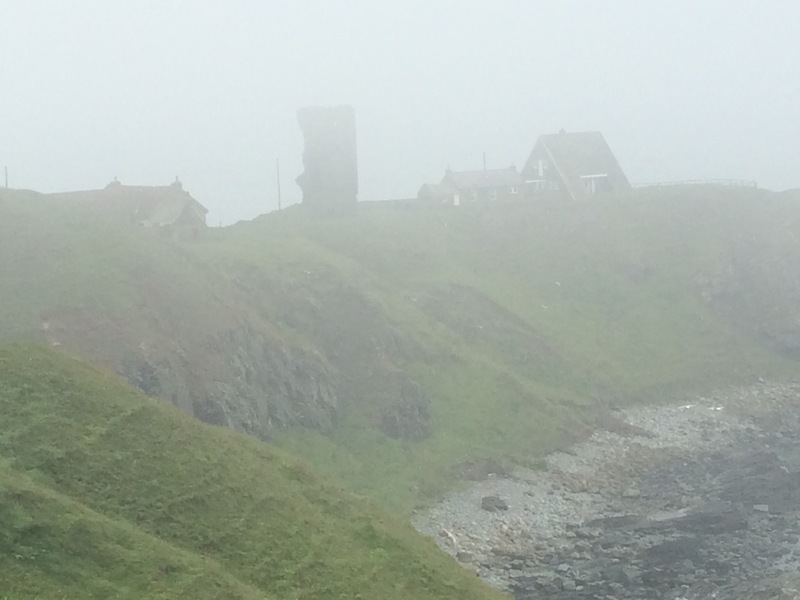 The mist cleared a bit and for half an hour I could see the old RAF Buchan golf ball radar on a hill. 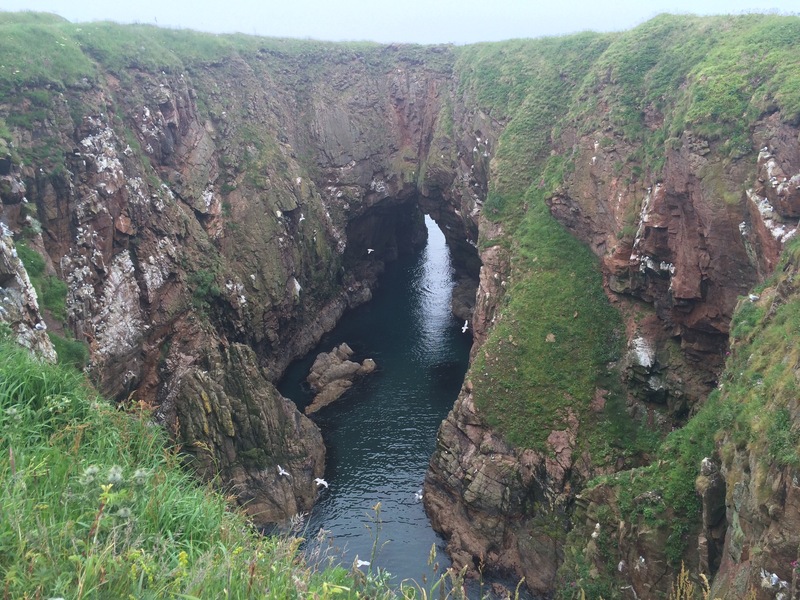 The cliffs were spectacular, particularly at Bullers of Buchan. All day I had the sights, sounds and smells of all the sea birds on the cliffs, and here there were some of the best views. 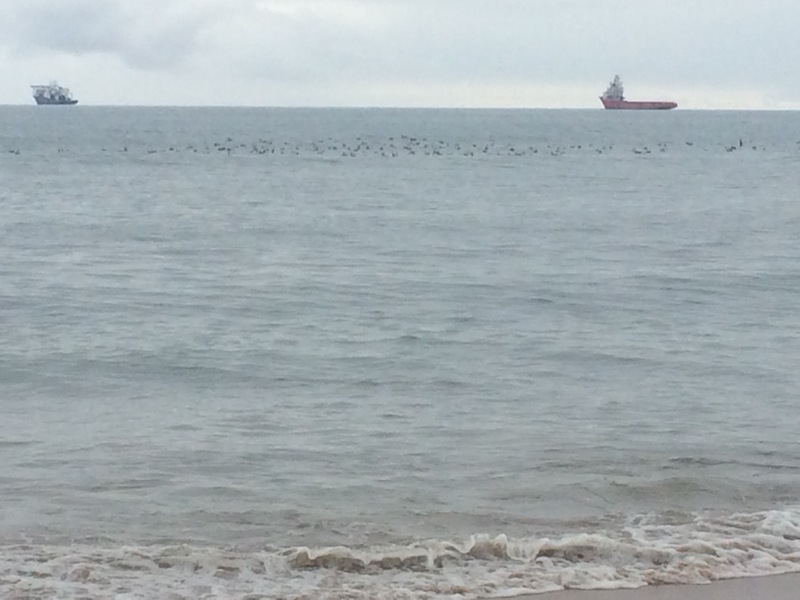 I didn’t see a puffin or a gannet, but everything else was in abundance, even a couple of buzzards. Not only were there lots of birds to keep me interested but the rocks that formed the cliffs seemed to change throughout this walk as well. 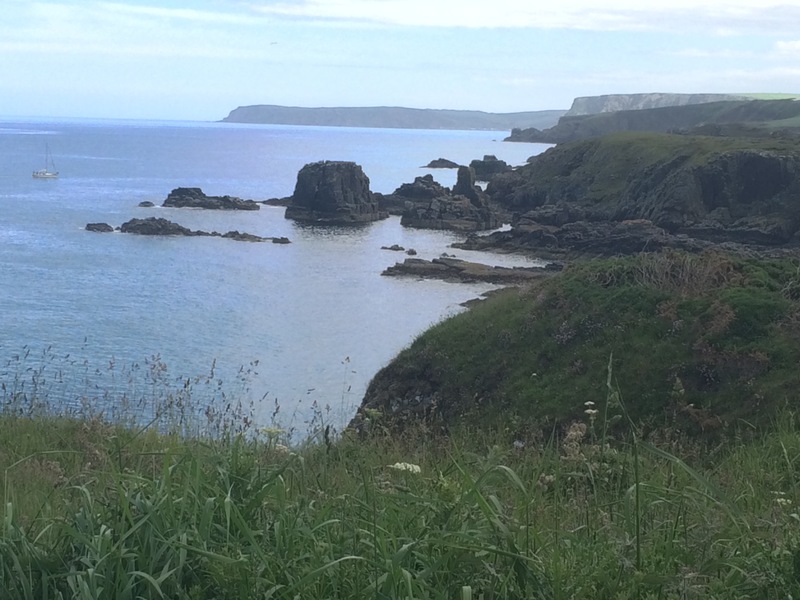 In better weather and with a better path this walk could well be at the top of the list of stunning cliff top walks. 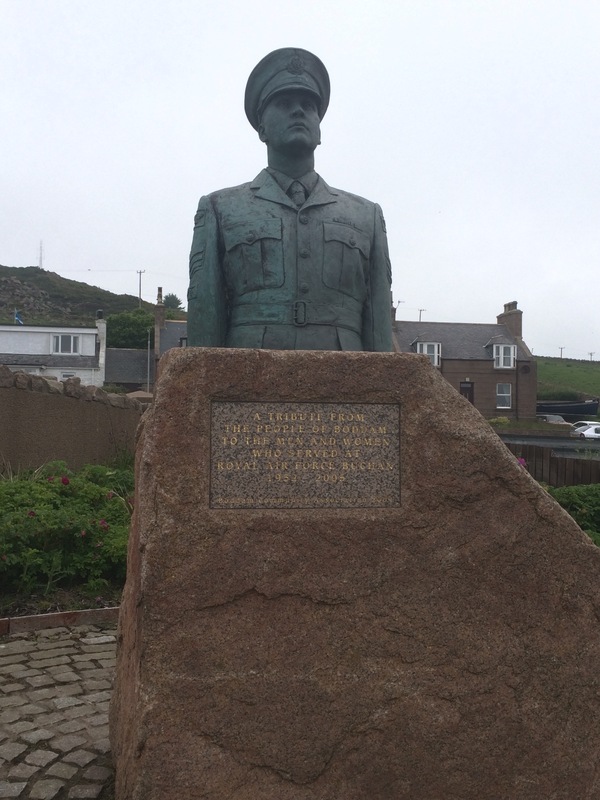 I walked past an old quarry and down into Boddam, with its memorial to RAF Buchan personnel. From here it was a short walk around a seafood factory, a power station, Sandford Bay and back to the guest house on the Southern edge of Peterhead. It was late and starting to rain. It had been a long day but the cliffs and the birds had been spectacular. Oli gave me a lift back to the beach on the North side of the River Don. 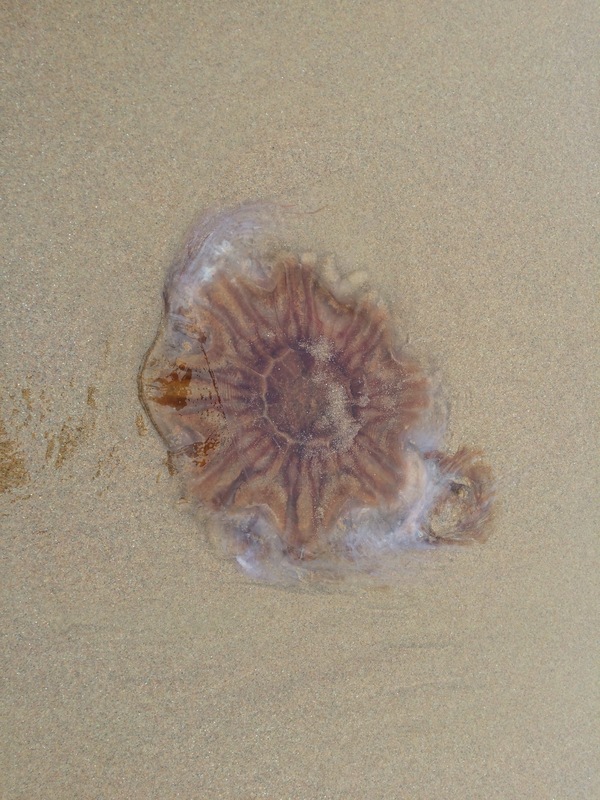 He walked the first couple of miles along the beach with me and I had an easy time of it because he carried my rucksack. It was nice walking with company. 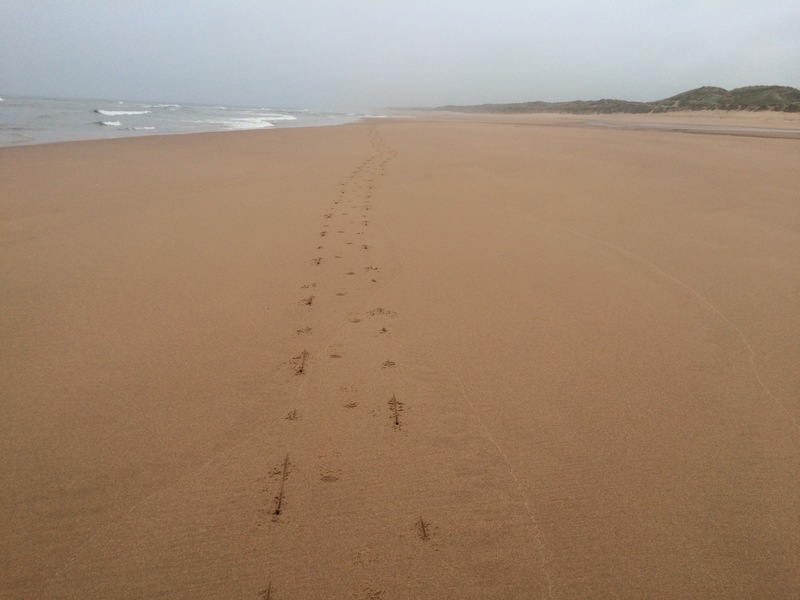 Balmedie Beach is about 10 miles long so I had planned to walk most of the day on the sand, which should make for easy walking. The weather forecast was rain and it wasn’t long before the fine mist in the air became a fine drizzle. The beach has beautiful golden sand and I saw very few people. 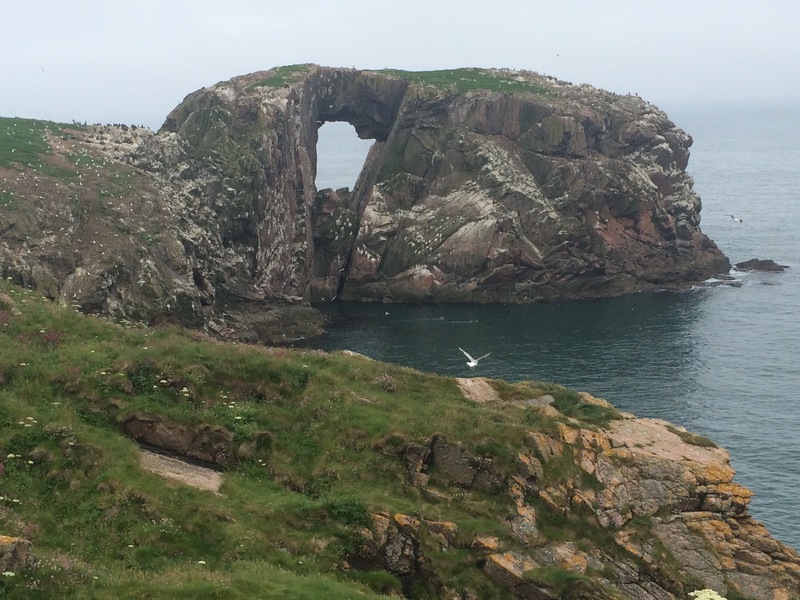 The further North I went, the more alone I seemed and the bigger the flocks of birds gathered on the shoreline: gulls, oyster catchers, one flock of eider ducks at one point and terns diving for fish. 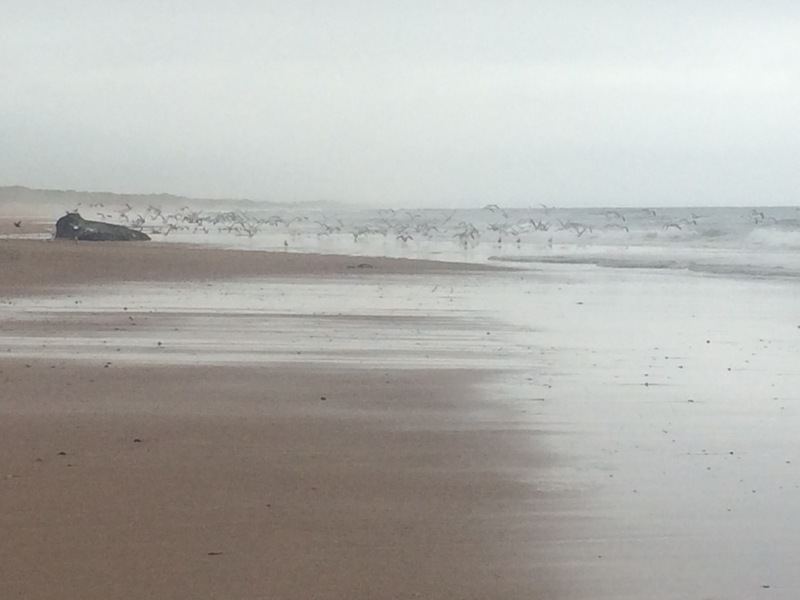 I also saw the odd seal playing just off the beach. The birds and the sound of the sea kept me company. 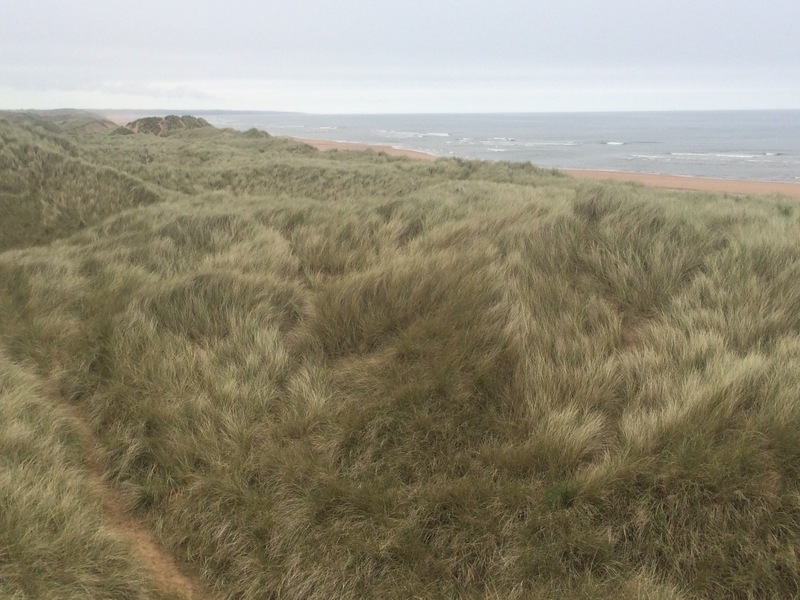 Halfway along the beach I walked through the only gap in the dunes and through Balmedie Country Park in search of a cafe in Balmedie. I saw a sign to the Beachside Cafe; little did I realise that it was a 30 minute walk from the beach! On the plus side, I was out of the rain for an hour and had a nice lunch. I walked back to the Country Park and thought I’d follow a path through the dunes. 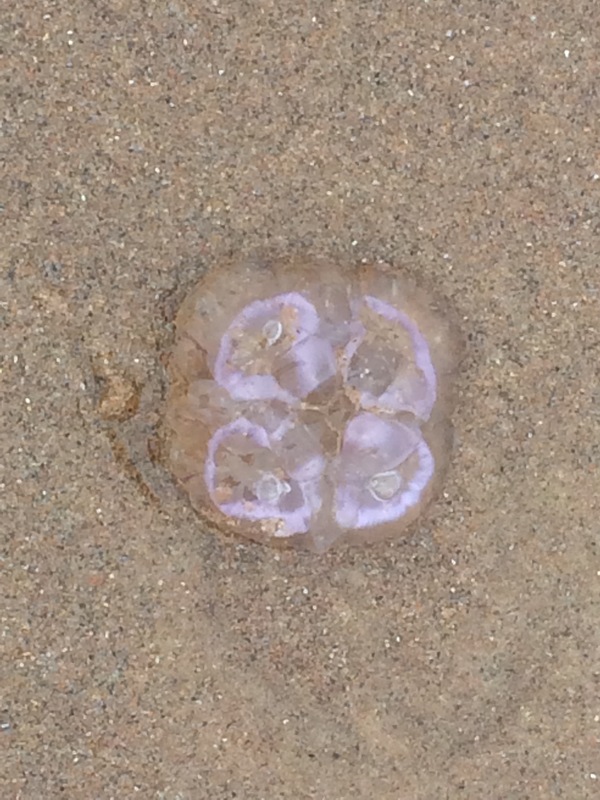 It soon petered out and I had to cross the dunes and get back onto the beach. After a few more miles I came to the River Ythan and had to turn inland to Newburgh. 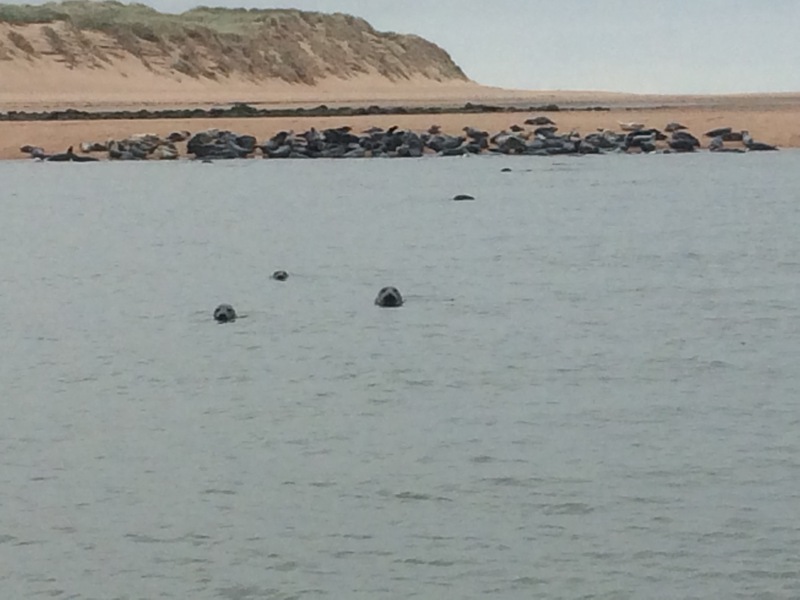 There was a colony of grey seals hanging around at the mouth of the river; most lying on the sand, some fighting and several in the water. The ones swimming were very curious about me. As I made my way into Newburgh the fine drizzle became heavier rain and I was forced to put on my waterproof. It was miserable and the thought of walking on to Collieston and wild camping, with not even a pub to go to, was appealing less and less. I walked past a bus stop and made a snap decision to wait 10 minutes for the next bus to Peterhead (tomorrow’s destination) as it is a bigger town. I found a basic guest house with a free room and was grateful to get dry. The weather forecast for the next few days is not good and today was pretty cold, only 9 degrees. I was glad I wasn’t camping. 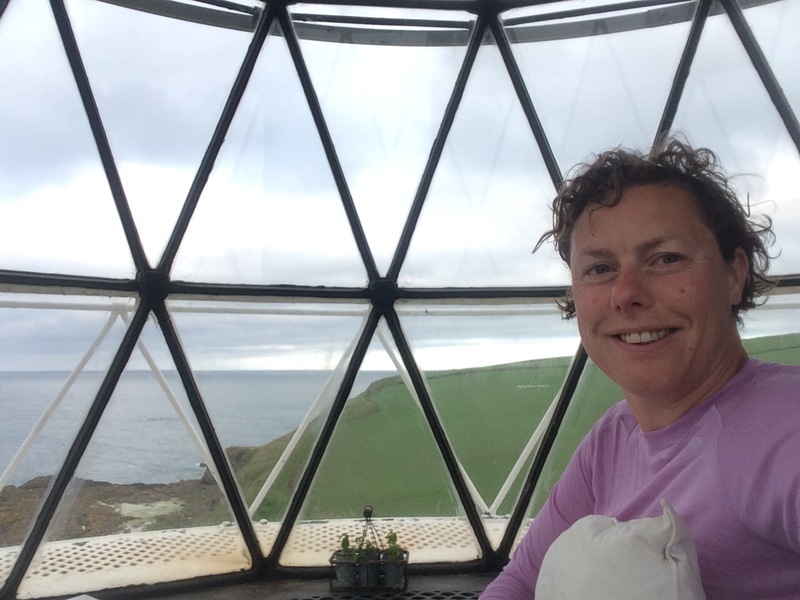 I woke up to the sound of screaming gulls and a wonderful 270 degree view out of the lighthouse. After breakfast Rohan walked me the “pub route” (scrambling around the cliffs) to Catelline, where she left me to catch the bus to Dunottar rather than walk on the road. 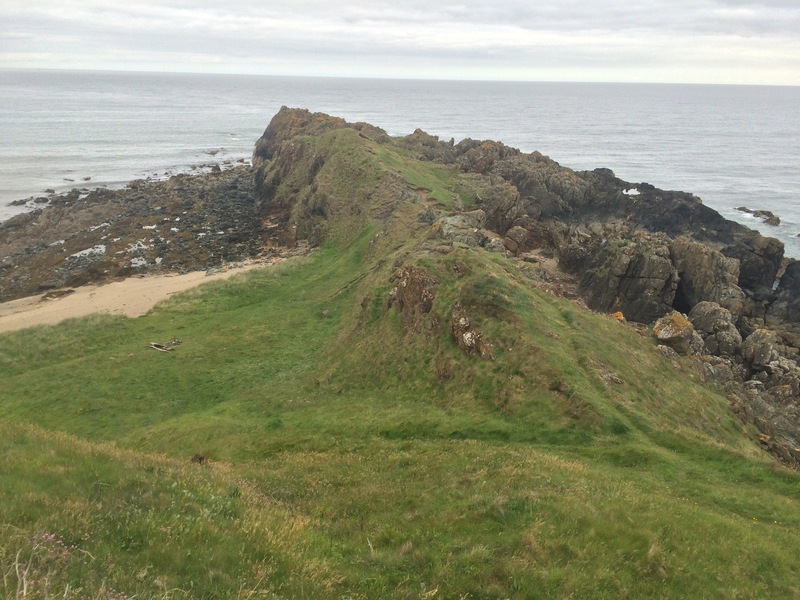 Dunottar Castle was worth seeing. 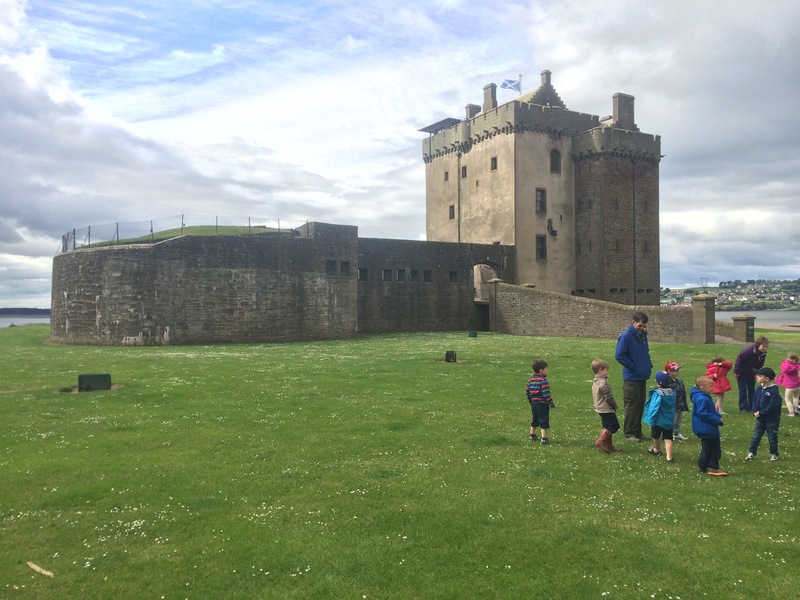 The ancient stronghold of the Earls Marischal of Scotland it has a long and colourful history due to its fantastic position on a high cliff surrounded by sea on 3 sides. It was the sight of a failed 8 month siege by Cromwell that saved the Scottish Crown Jewels. 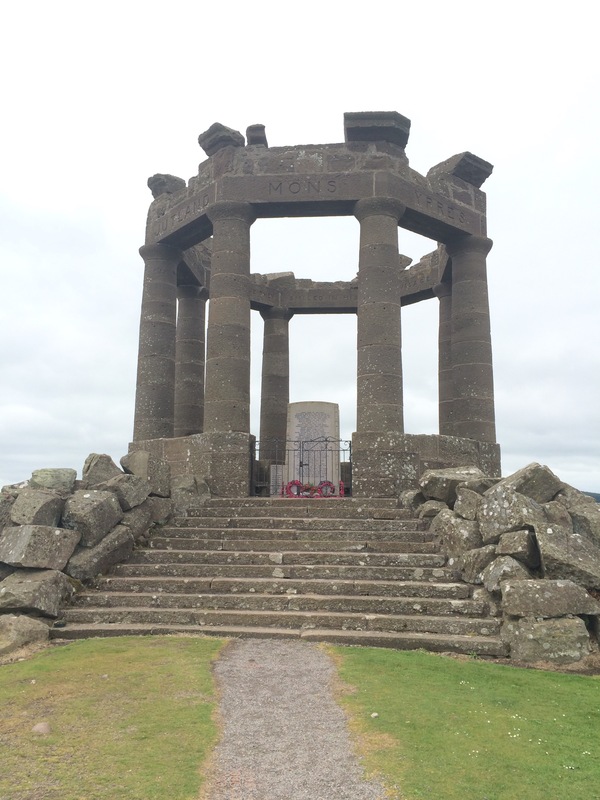 From Dunottar to Stonehaven was a well trodden path (hurrah) via the Stonehaven war memorial on Black Hill. It was built in 1922 and was designed to look like temple ruins. 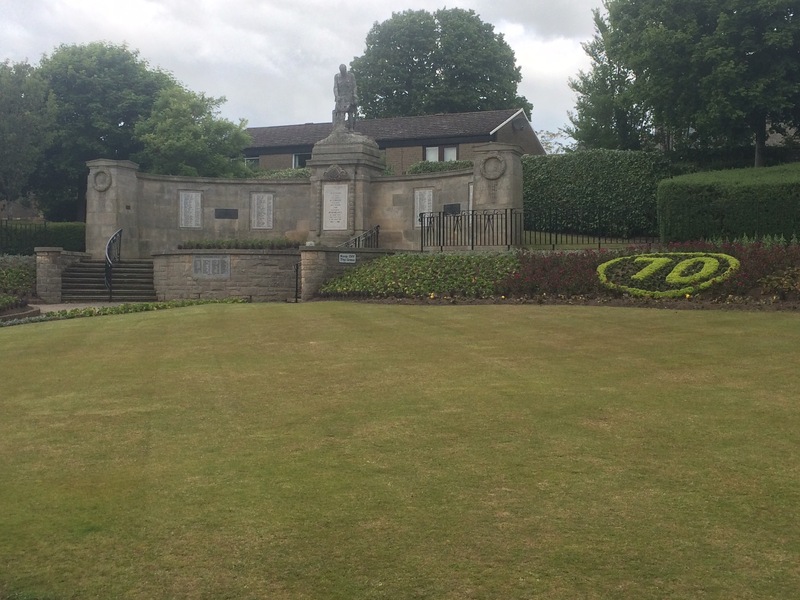 It’s siting and design made it possibly the most impressive war memorial I had come across. 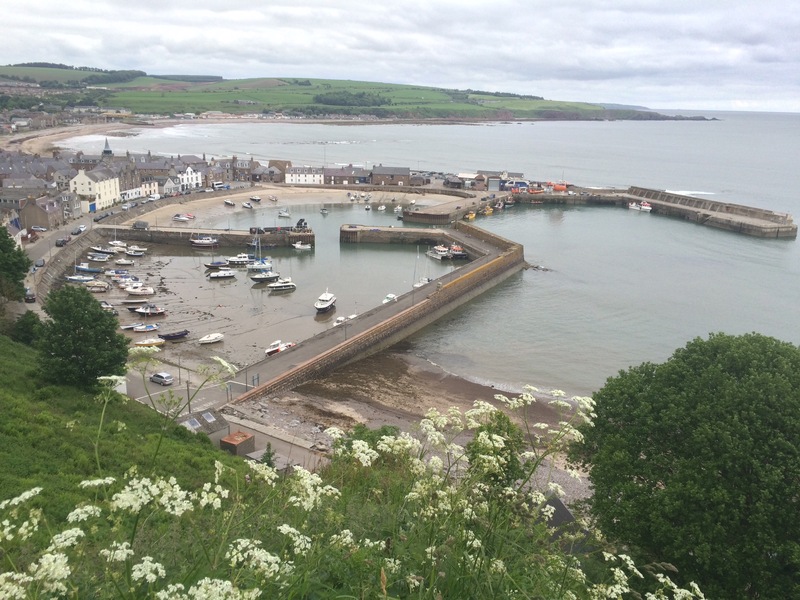 It was then a short walk down into Stonehaven, the birthplace of Robert Thompson, inventor of the pneumatic tyre. It seemed like a really nice town so I had a look around and stopped at the Cool Gourmet cafe, which I highly recommend for coffee and a homemade scone. Unfortunately the open air heated swimming pool, filled with sea water at the start of the season, was closed otherwise I might have been tempted for a dip. 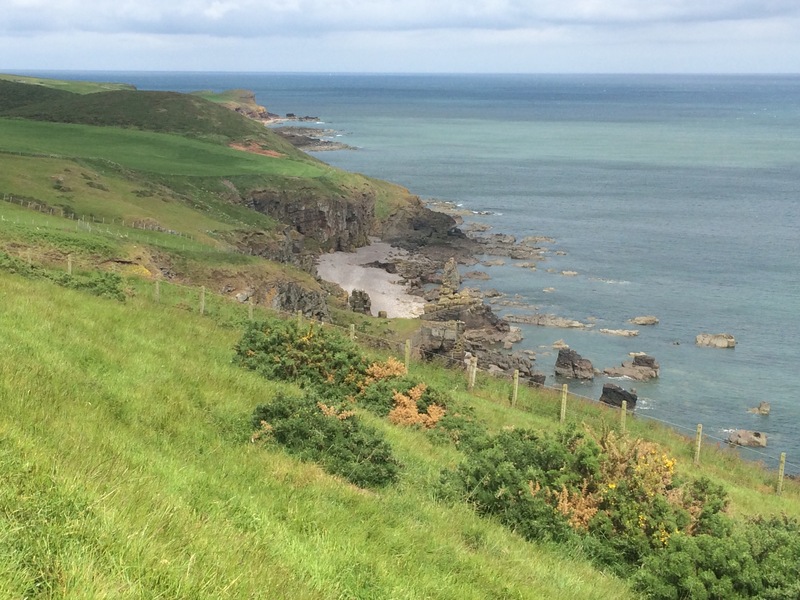 Instead I decided I wanted to walk to Garron Point, which is the Highland fault boundary, and is just North of Stonehaven. 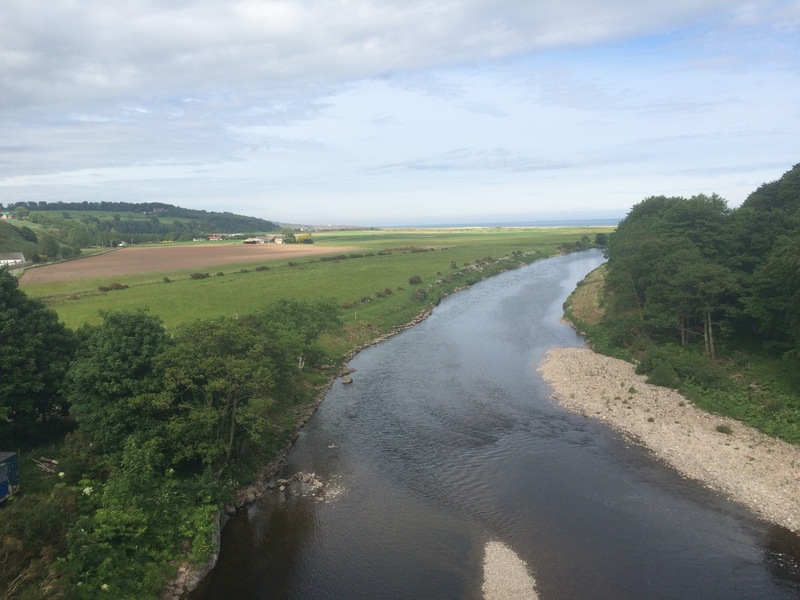 It marks the line between the sandstone rocks to the south and the harder, granite-type rocks to the North, the border between the Lowlands and the Highlands. 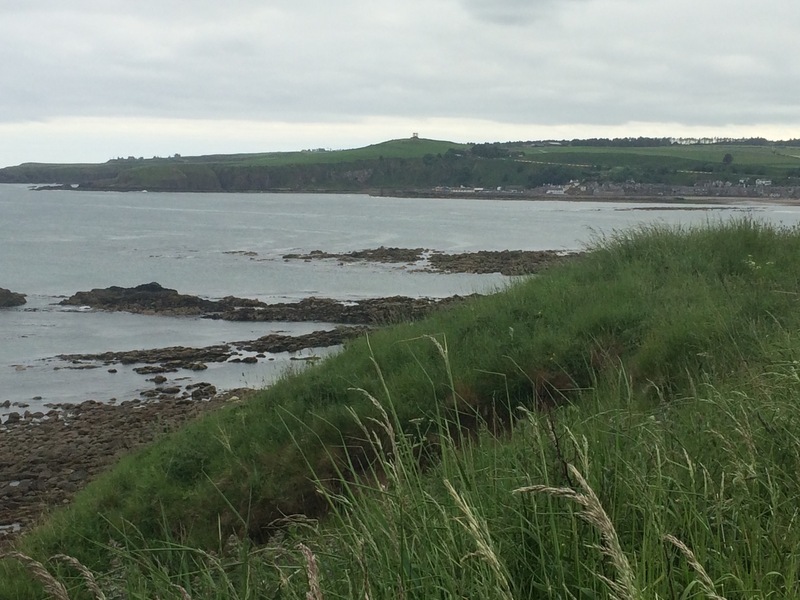 I’m pleased I walked this route up through Cowie Kirkyard and across the golf course as the views back to Stonehaven, Black Hill Memorial and Dunottar Castle were excellent. 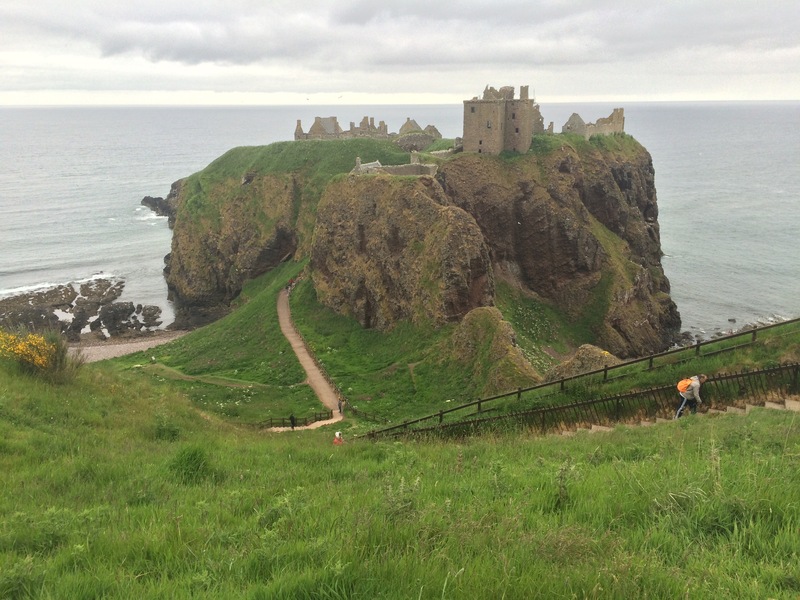 As it was already the afternoon, and the next section didn’t have marked paths, I walked back into Stonehaven to catch a bus to Portlethen. The bus stopped at Asda in Portlethen so I popped in to get a couple of bits and then thought I might as well push the boat out and get a taxi to Cove Bay to avoid a stretch of road walking. 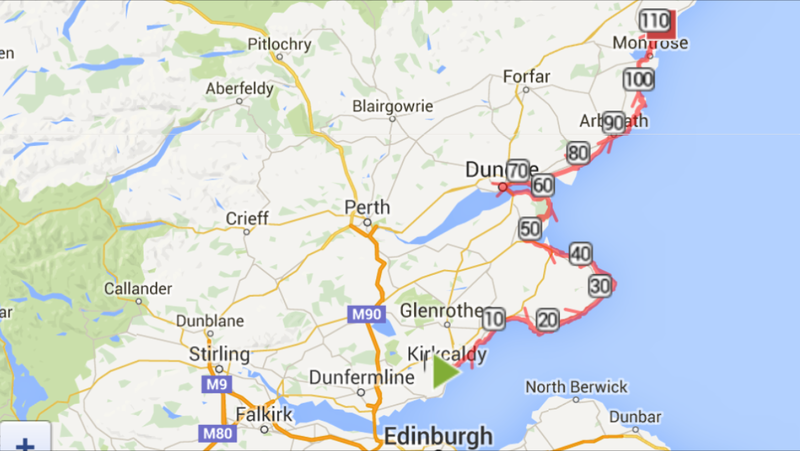 This worked well as it enabled me to enjoy the last stretch into Aberdeen along a beautiful coastline. 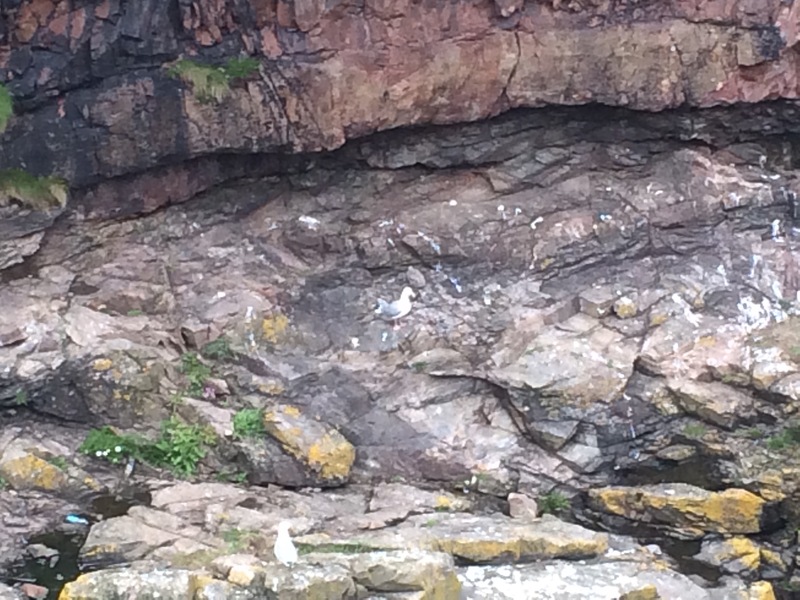 I took the time to stop and watch the kittiwakes and razorbills nesting on the cliffs, ignoring the terrible smell. Can you see this kittiwake’s chick? 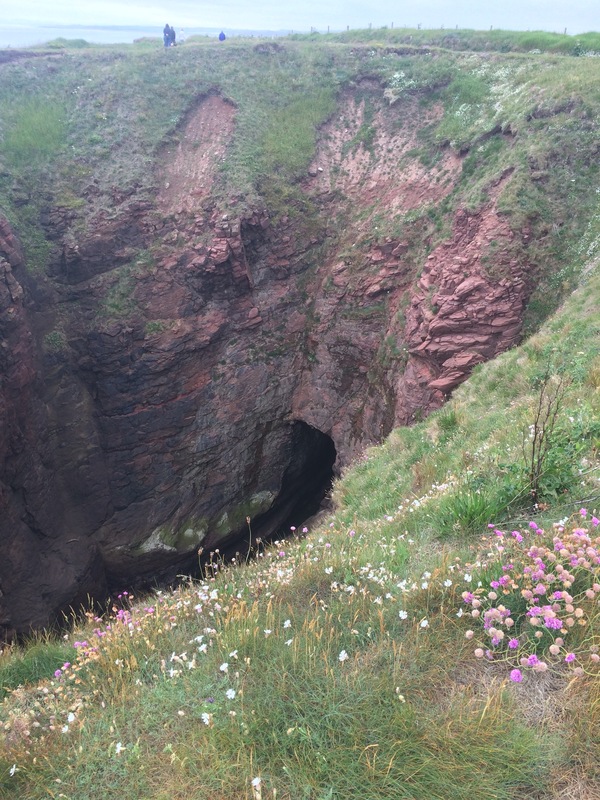 There were lots of caves in the cliffs and it was generally a very pleasant walk. I crossed the stony Nigg Bay and then rounded Girdle Ness, past the lighthouse, and the port of Aberdeen came fully into view. There were lots of ships anchored in the bay and plenty more in port. 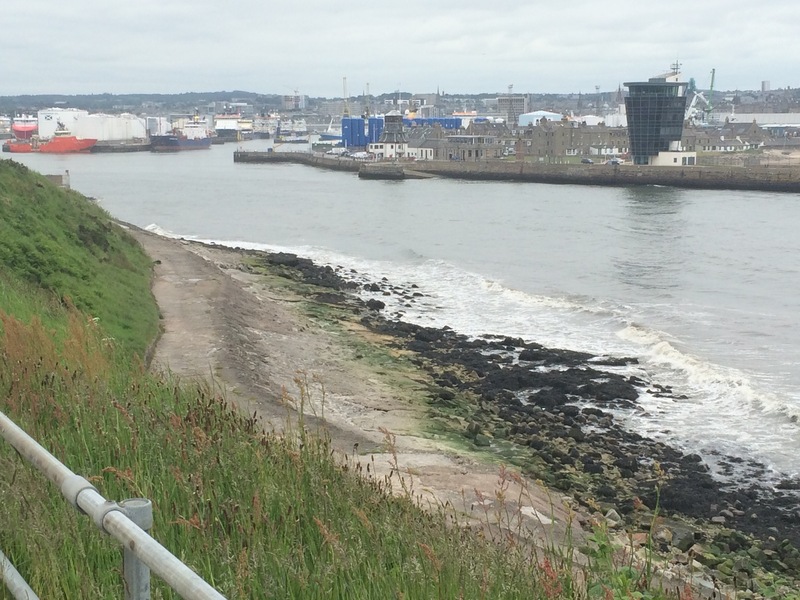 It was a long walk around the port to Footdee, the old port area of Aberdeen with the new Marine Operations Centre. Here I met Oli, a friend of Sam’s, who had kindly agreed to put me up for the night. Another outdoors person, like Rohan, it was nice to chat and Oli was a great host. I was feeling really lucky to have had a few nights of good company now. Another cold, grey and rather windy day. 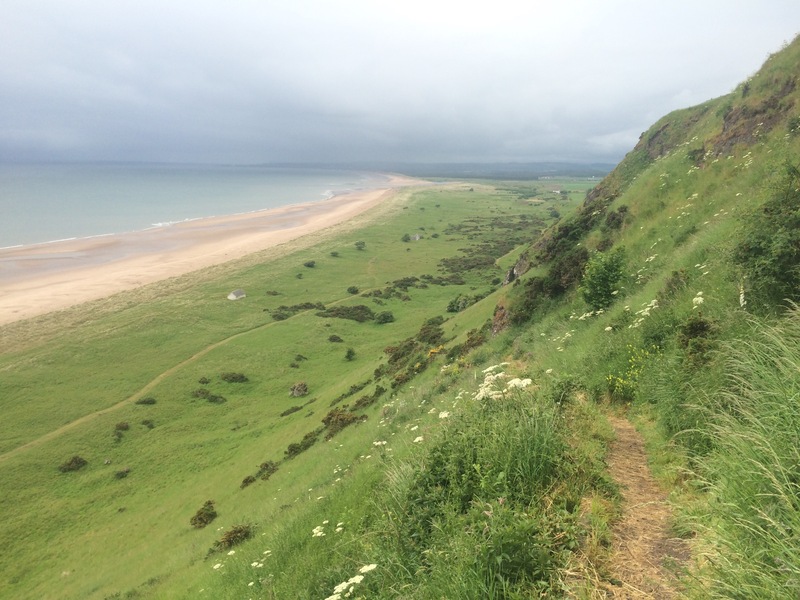 I set off from Fran’s and headed to the St Cyrus beach, which was stunningly beautiful even under dark clouds. 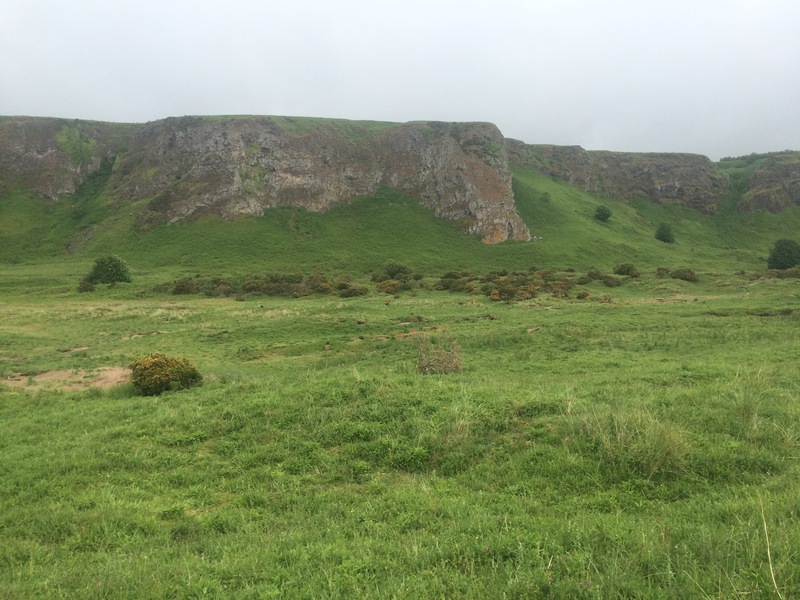 It has enormous cliffs behind it that were formed from the eruption of a volcano near Montrose a long time ago. 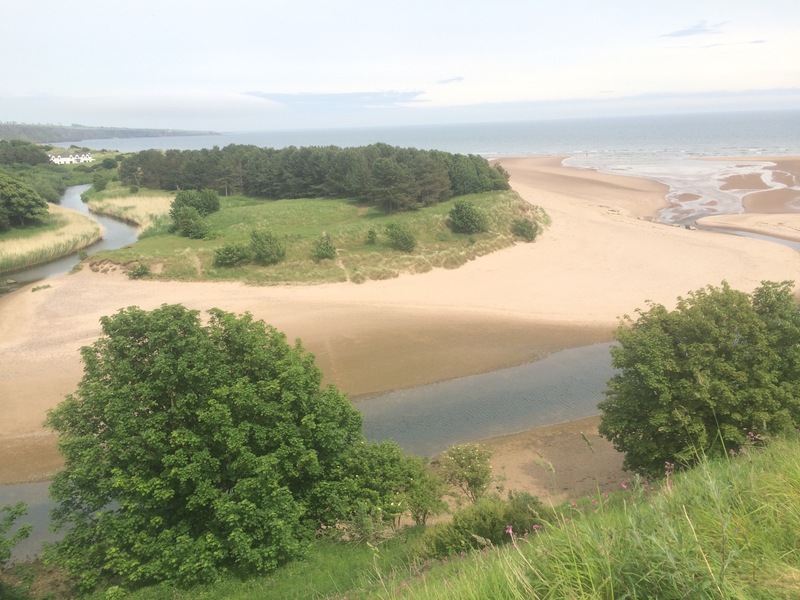 The River North Esk flows out into the sea along a plain that splits the beach and you can see it has changed its course and some old fishing houses that were once by the river are now derelict buildings marooned in the dunes. I started walking on the beach but it was too windy and the sand too soft so I walked through the dunes instead and then had to scale the huge cliff via one of the few paths to the top. From here things got trickier as the map said there was a path, which the council had closed for safety reasons (erosion) and the only other way was to walk along the main A92 road. I walked through a potato field looking for another route and couldn’t get out over the electrified fence so had to double back. I decided to risk the path anyway and it was alright. 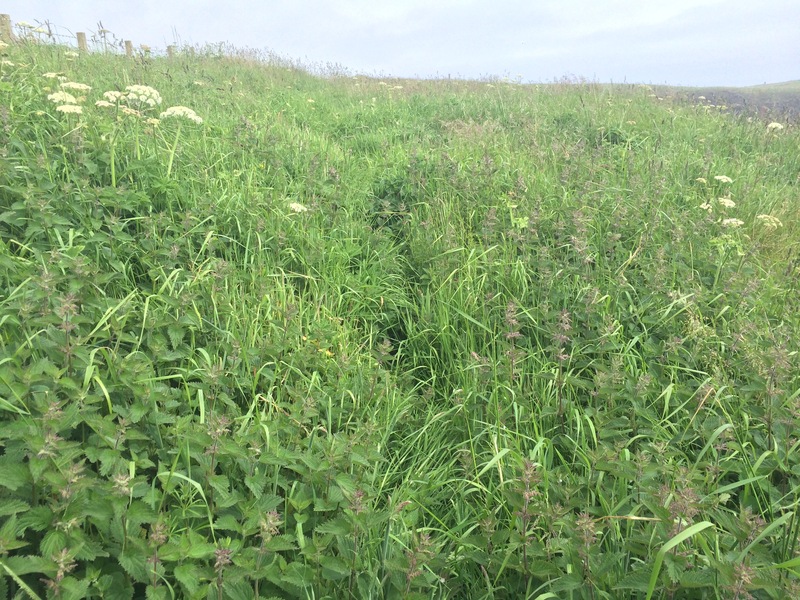 The main problem was that it was so overgrown I was wading through long grass and nettles so that, in the current weather conditions, I ended up soaked through from the waist down, including my socks and inside my boots. But I made it to Johnshaven, albeit over an hour later than I expected as the going was very slow. I had a quick stop at the pub there for a coffee and a chat to the owner who was from London. 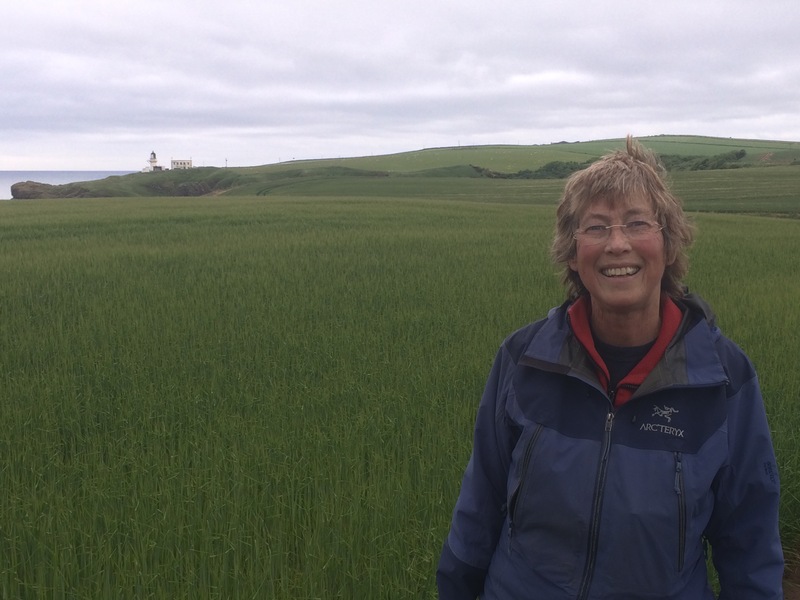 She has lived here for 18 years and loves the “rugged East Coast of Scotland”. I was warned coastal paths would be hard to come by. On the way out of Johnshaven I saw a lady standing in her porch looking through binoculars so I tried to see what she was looking at; a small pod of dolphins heading North near the shore. My first sighting, brilliant. The kind lady lent me her binoculars to have a better look and I saw a couple of youngsters in the pod. They were travelling so slowly that I was outpacing them as I walked along the coastal cycle path to Gourdon; the easiest walking of the day. 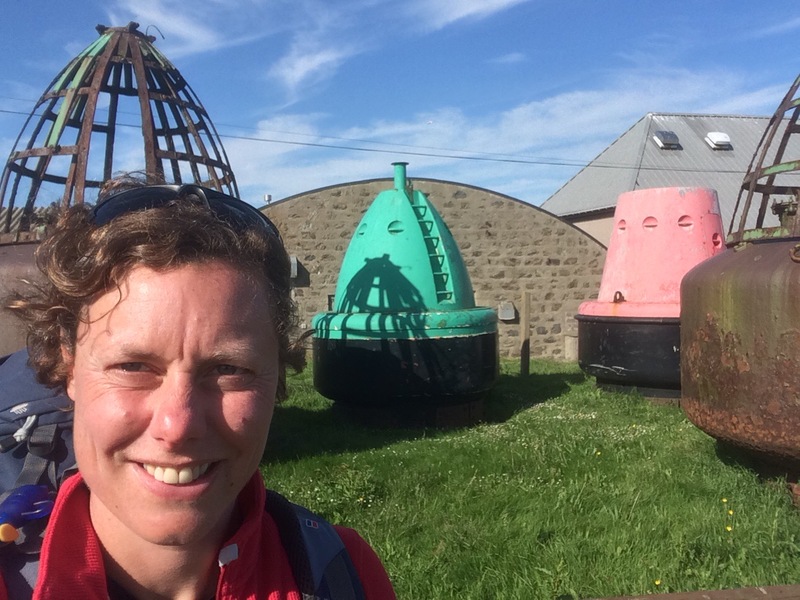 Gourdon is a small fishing village and I stopped to have a quick look in the small museum there that houses the Maggie Law lifeboat – essentially a rowing boat. It was commissioned in 1890 by the fishermen of the village who all agreed to be taxed a penny to pay for it. 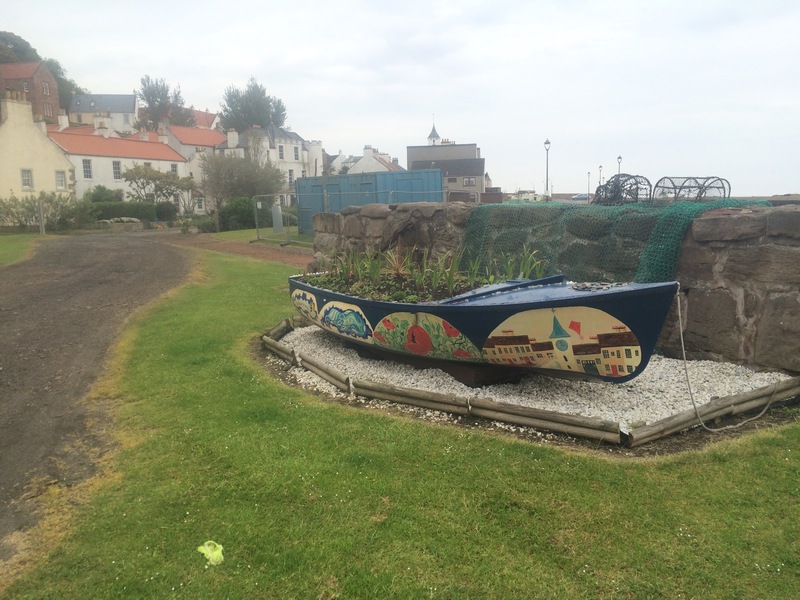 The village already had a bigger, RNLI lifeboat but the fishermen were worried that they needed a flat-bottomed lifeboat that could rescue people from the rocky shoreline where boats were likely to get into difficulties. In the end they rescued 36 people between 1890 and 1930. What a heart warming story. 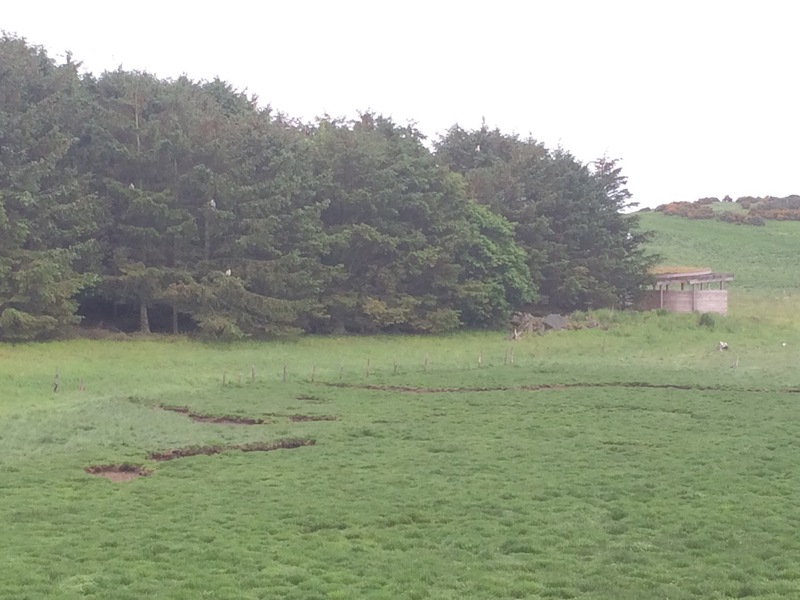 It was only a mile from Gourdon to Inverbervie and once across the town’s river the path petered out. 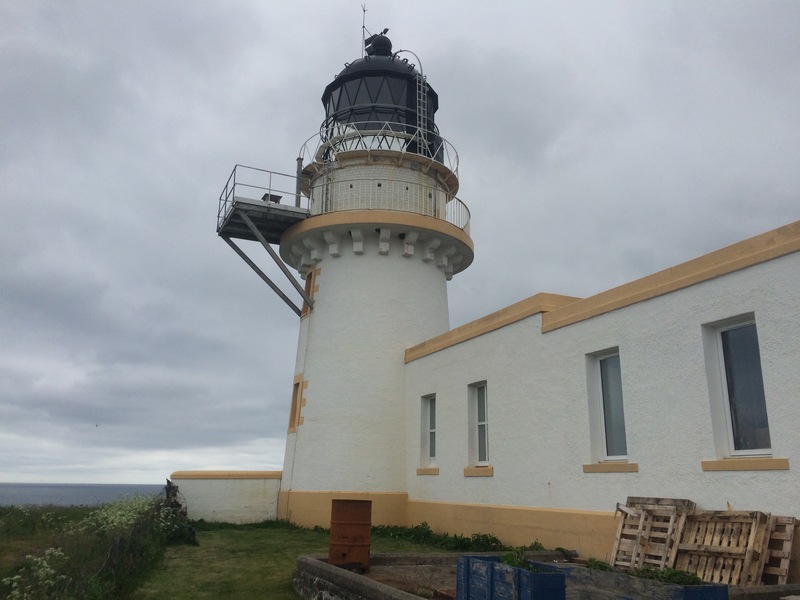 It was then a case of scrambling up the rocks, following sheep tracks, walking through barley fields and climbing several fences to make my way to Tod Head lighthouse to meet Rohan. It was worth the effort. Ever get the feeling you’re being watched? 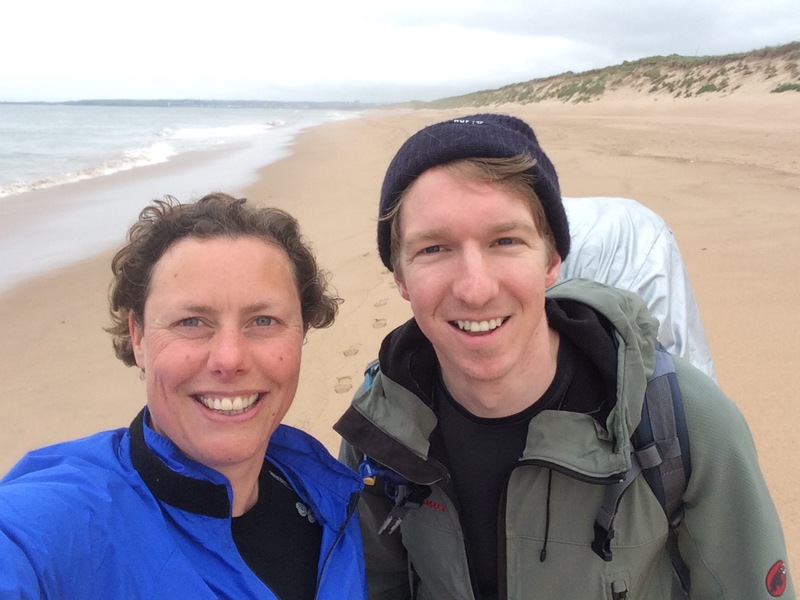 Rohan is an incredible lady that Sam put me in touch with as she does a lot of wild camping. 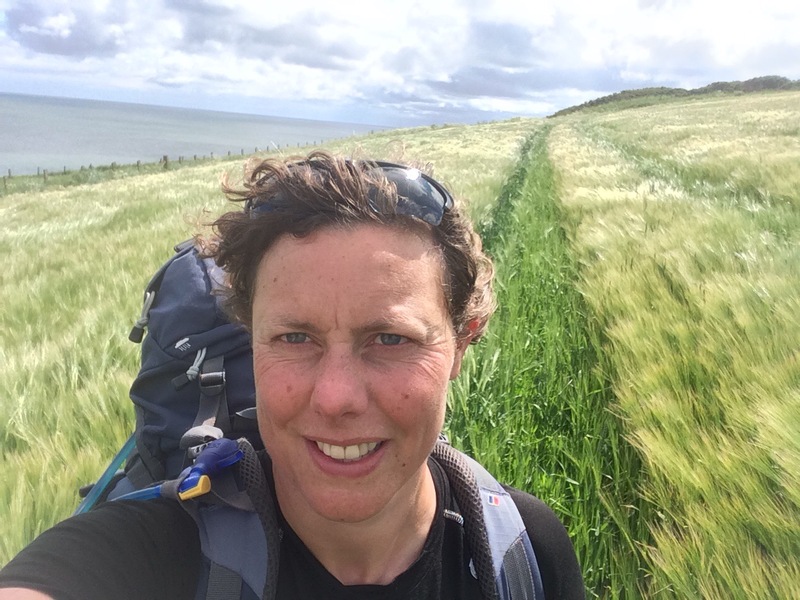 She has climbed all the Munros and the Corbetts and is an expert at wild camping so I had lots of questions. She was in the process of turning the lighthouse into her home and very kindly put me up for the night. 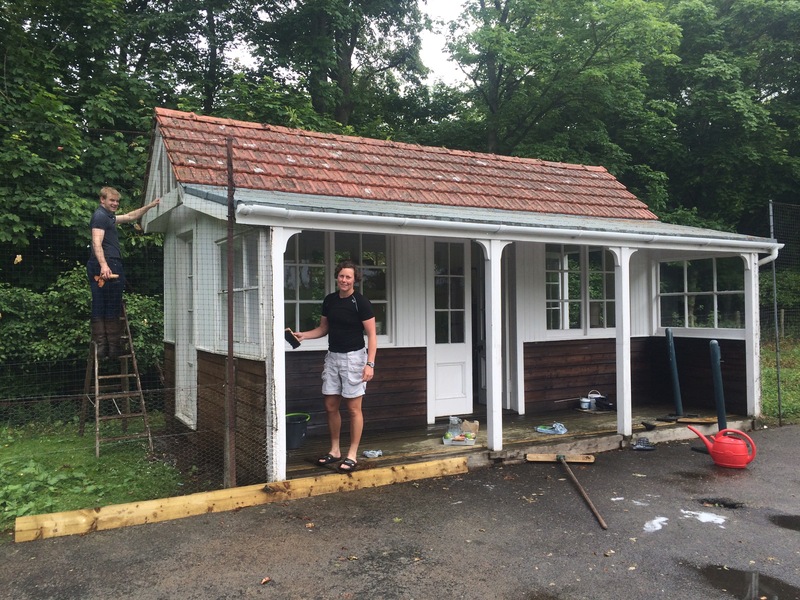 Despite the building site and no running water in the main house Rohan cooked a wonderful dinner. I ‘camped’ at the top of the light tower listening to the howling wind and woke to the screaming birds. What a fantastic experience. Thanks Rohan.